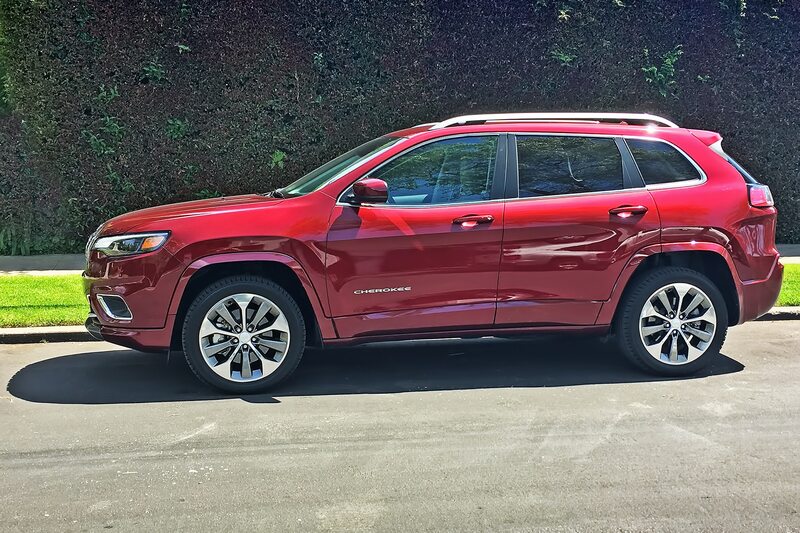 I wasn’t supposed to drive the new 2019 Jeep Cherokee—at least, not the week that it arrived on my doorstep. 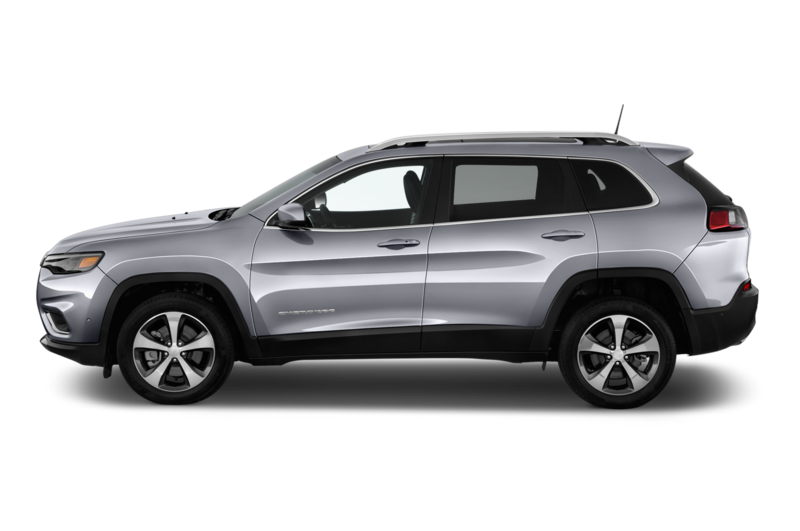 Somebody apparently smashed-up the test car I had scheduled many weeks before, so at the last minute the Cherokee arrived in its place. 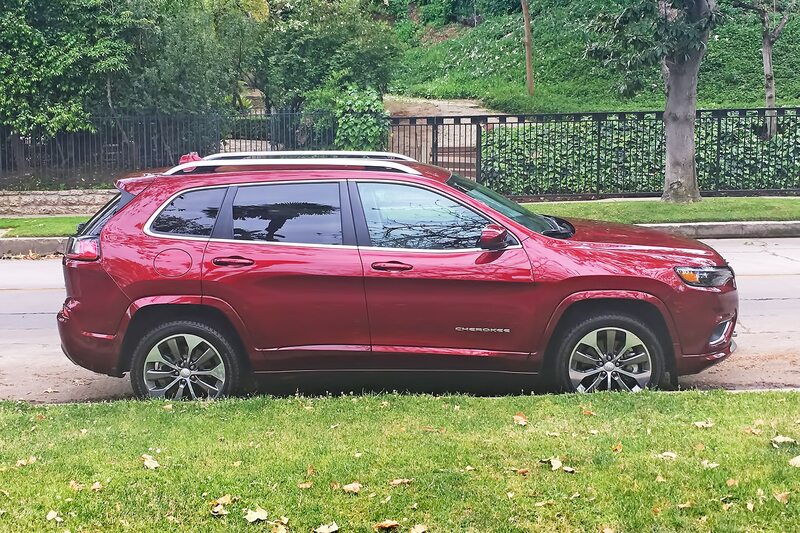 I hadn’t driven the previous, fifth-gen Cherokee in a long time. 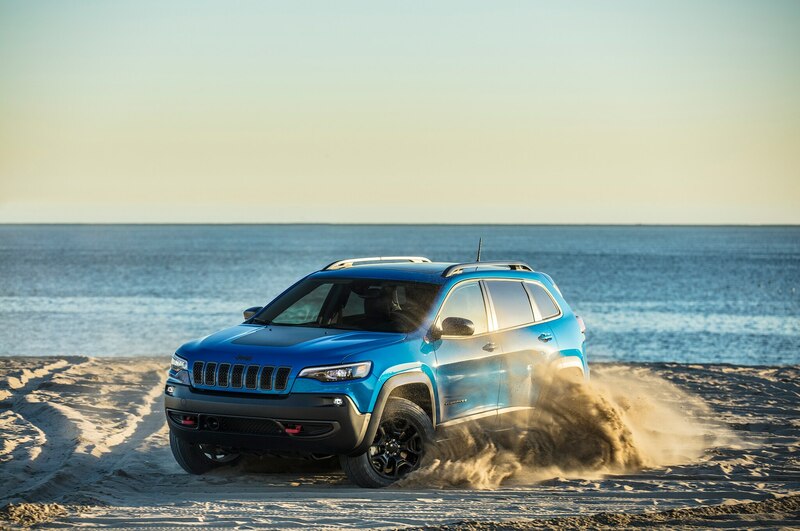 But, being a long-time Wrangler fan (and former owner), I’d really never given the model much thought anyway. 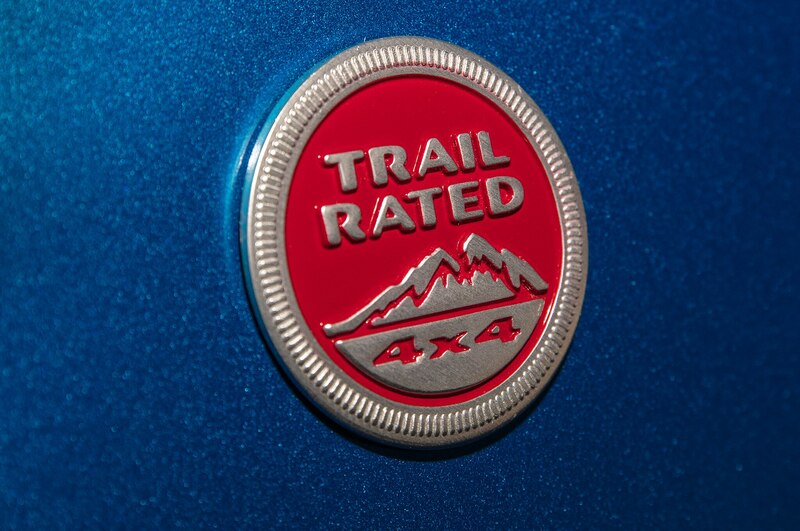 The Wrangler has always been “my kind” of Jeep. 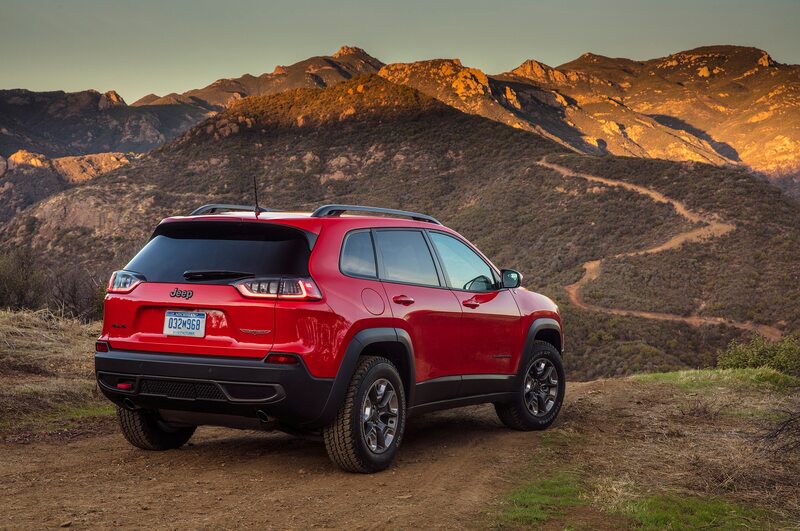 That Cherokee, the so-called “KL” edition, seemed a far cry from the square-jawed style of the classic, second-gen XJ Cherokee I’d known as a young man. 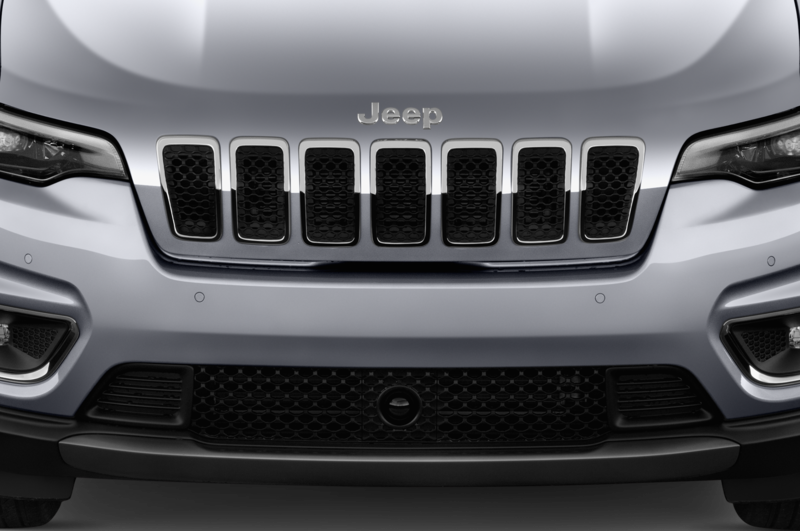 The previous KL was squinty-eyed, strange-looking, and transverse-engined—definitely not my kind of Jeep. 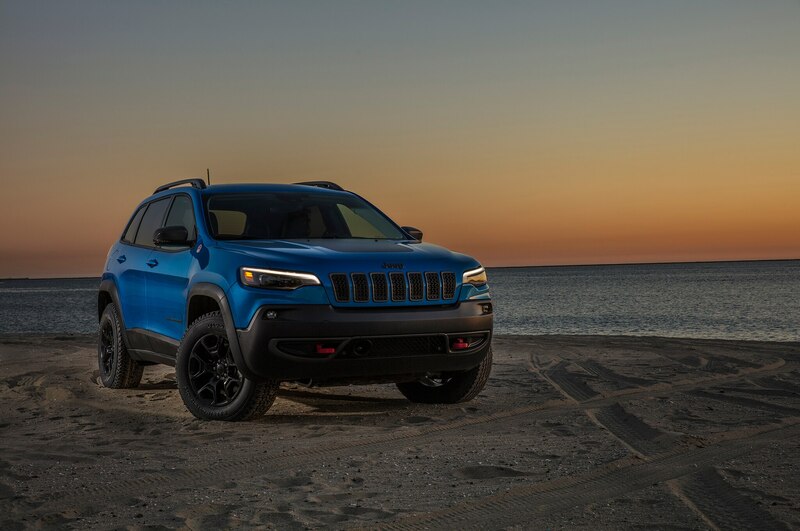 Happy to say, the 2019 edition has been extensively refreshed, and within minutes of sliding behind the wheel I was nodding my head in approval. 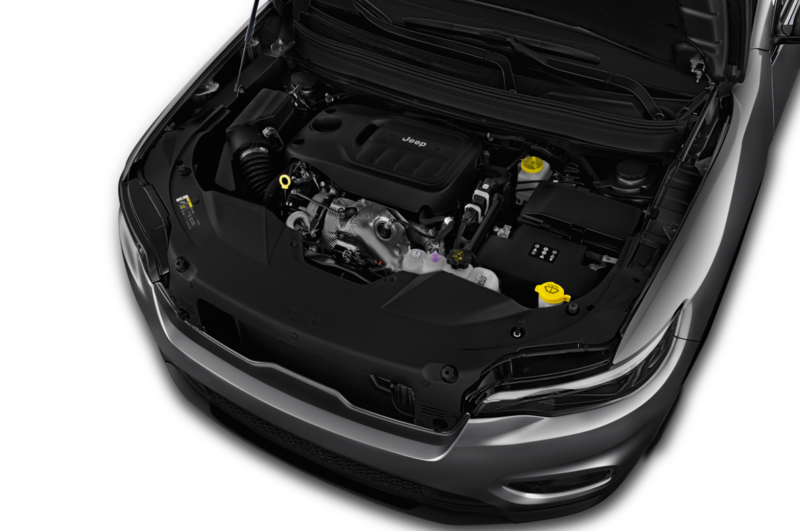 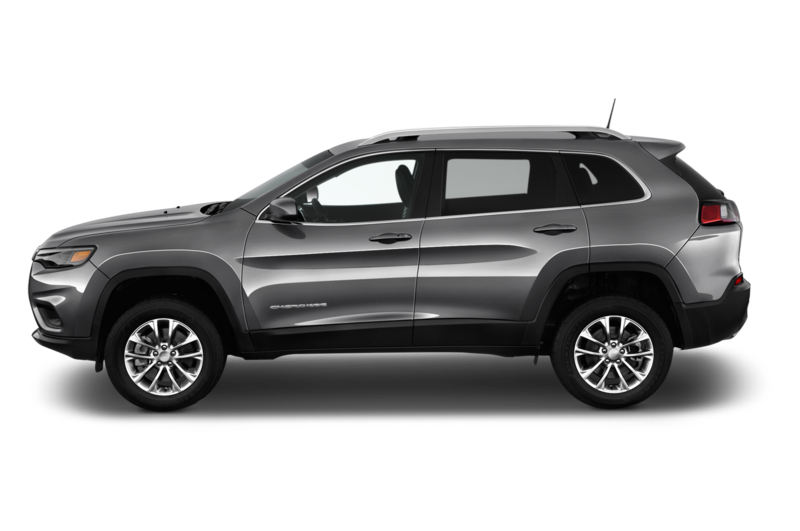 Yes, the engine layout is still transverse, but that doesn’t bother me as much anymore because the new Cherokee looks much more like a real Jeep. 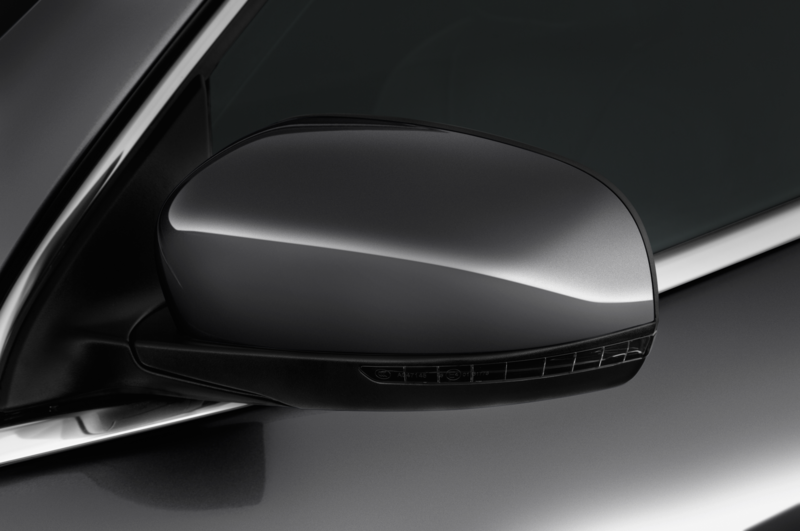 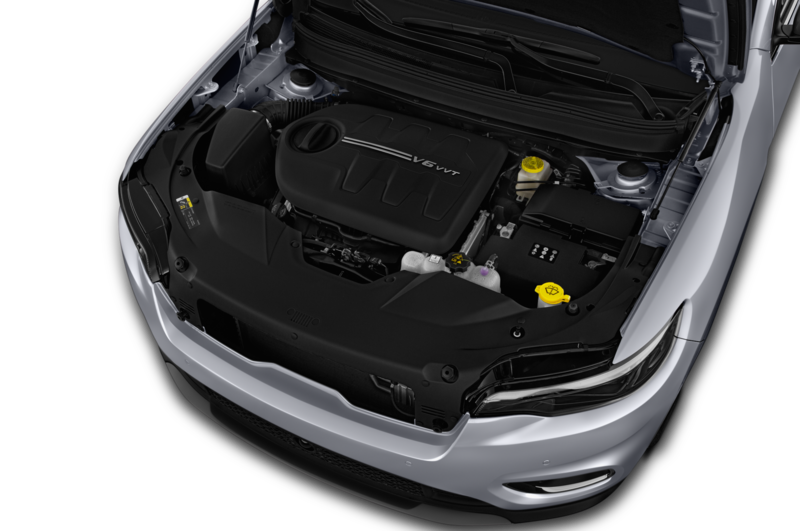 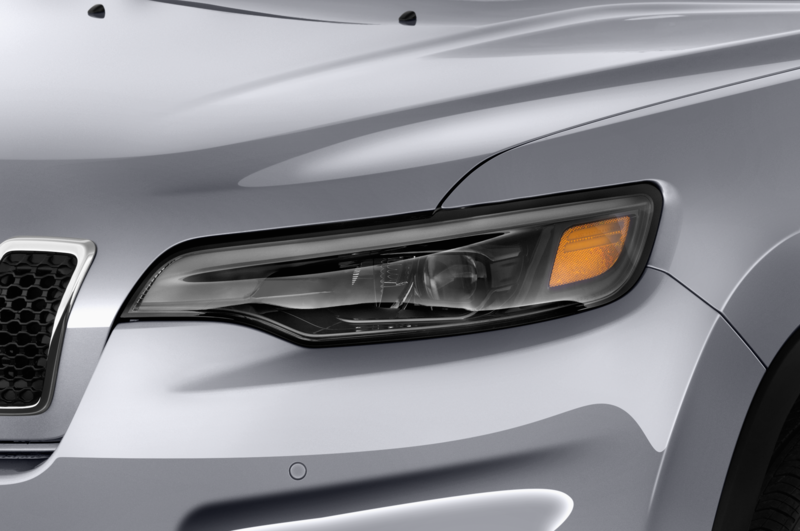 The front end is significantly revised, with a more purposeful face, headlights where they’re supposed to be, and a hood with a muscular crease (it’s also now aluminum). 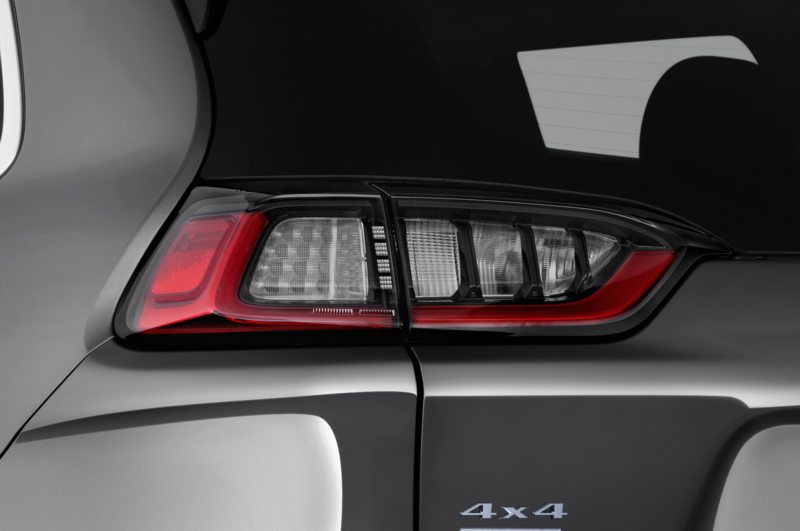 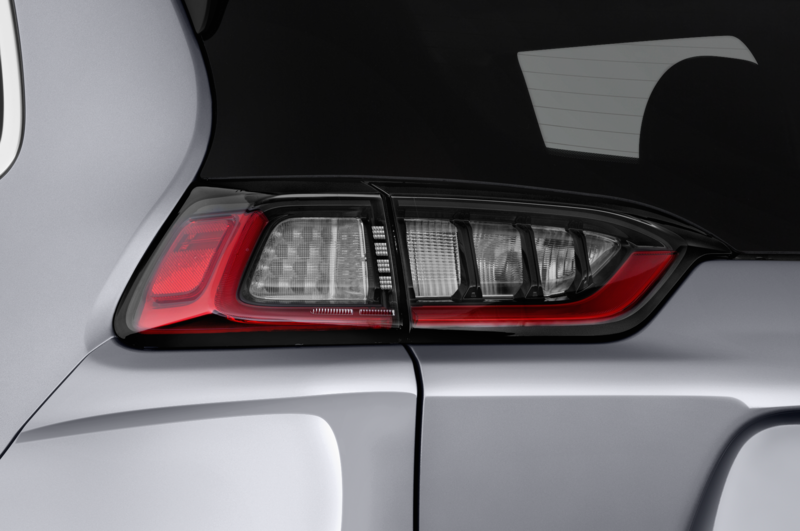 Other exterior changes include new LED taillamps, revised bumpers, and a lightweight, power-operated composite liftgate. 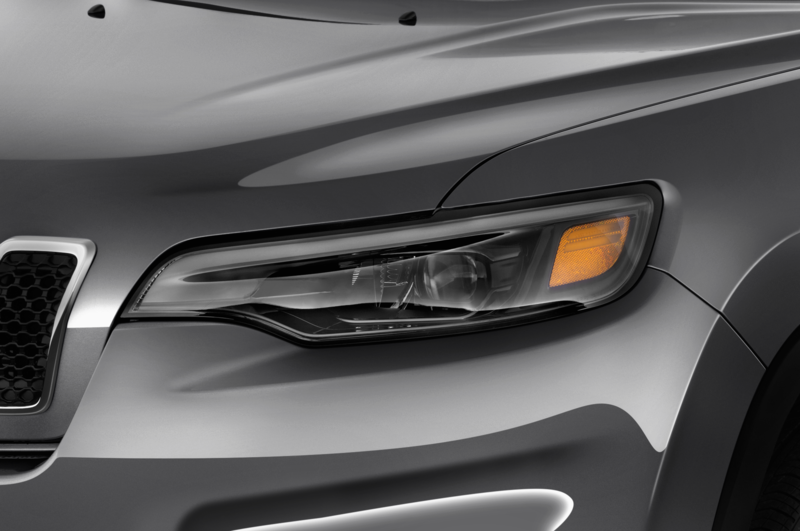 All in all, it’s a massive visual improvement. 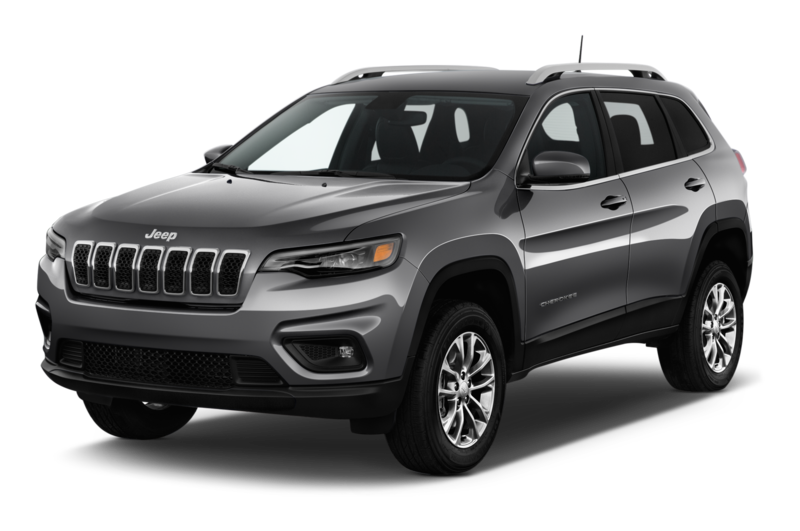 My Cherokee tester was an uplevel Overland 4×4 edition. 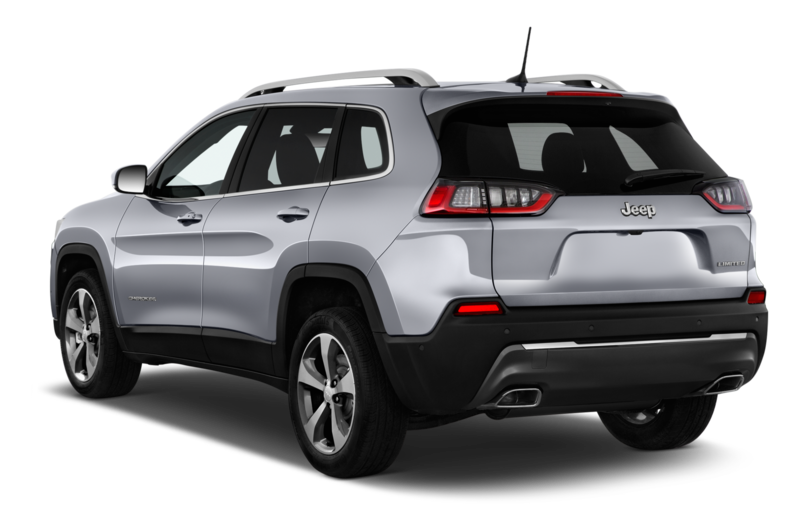 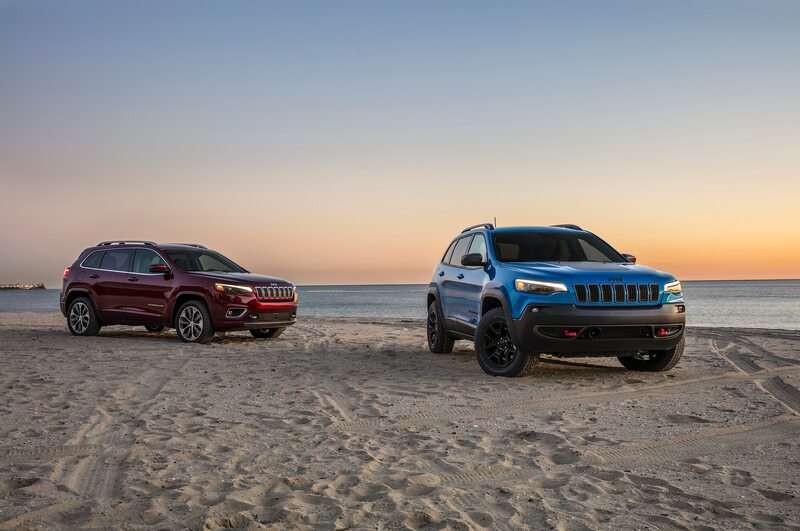 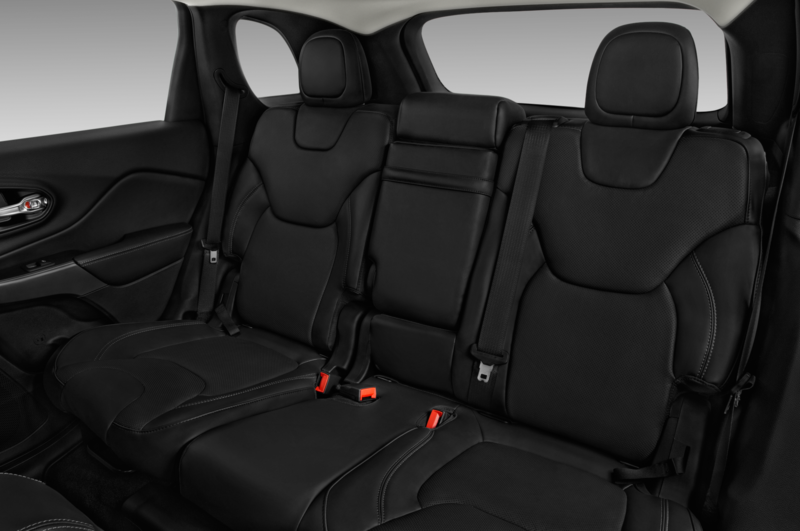 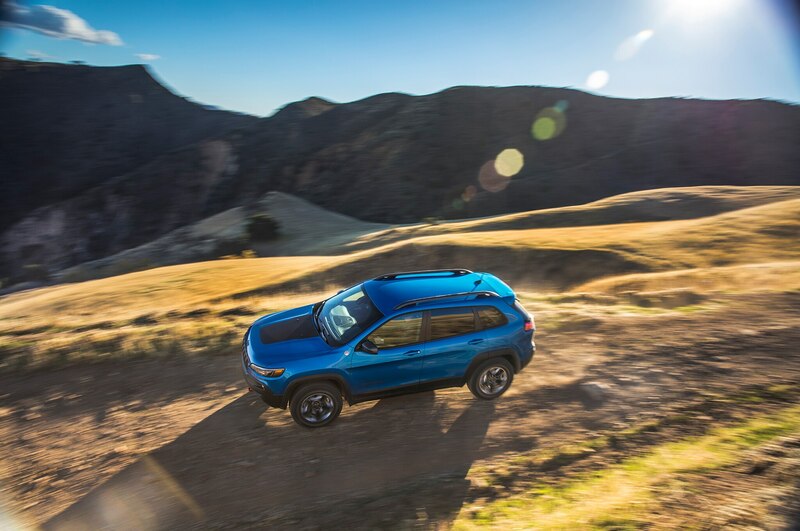 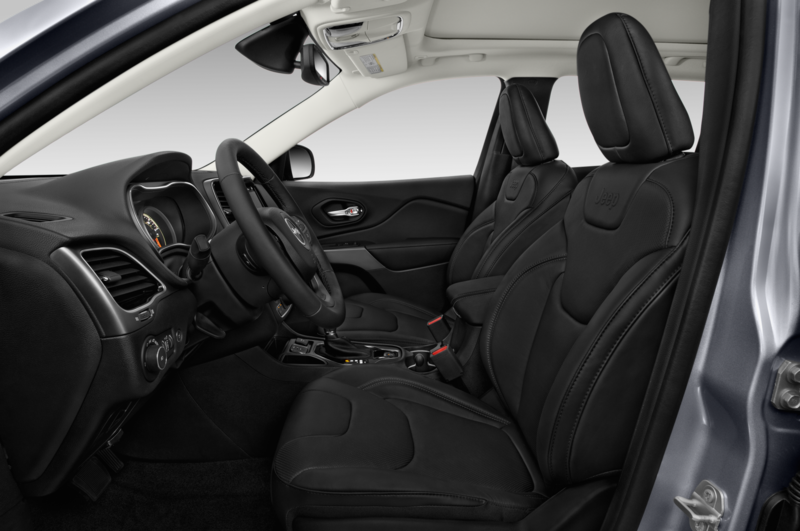 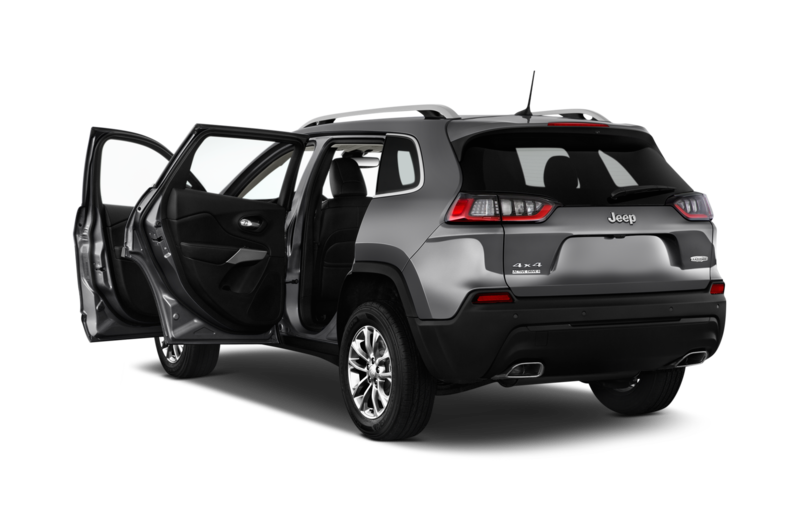 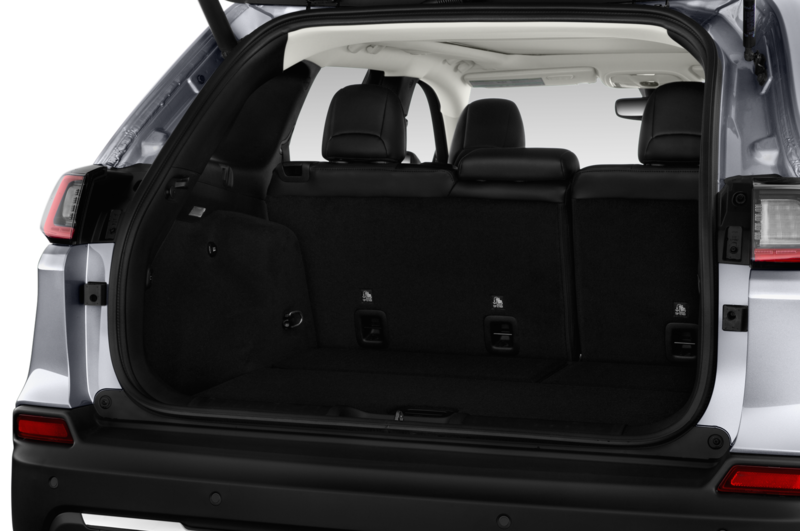 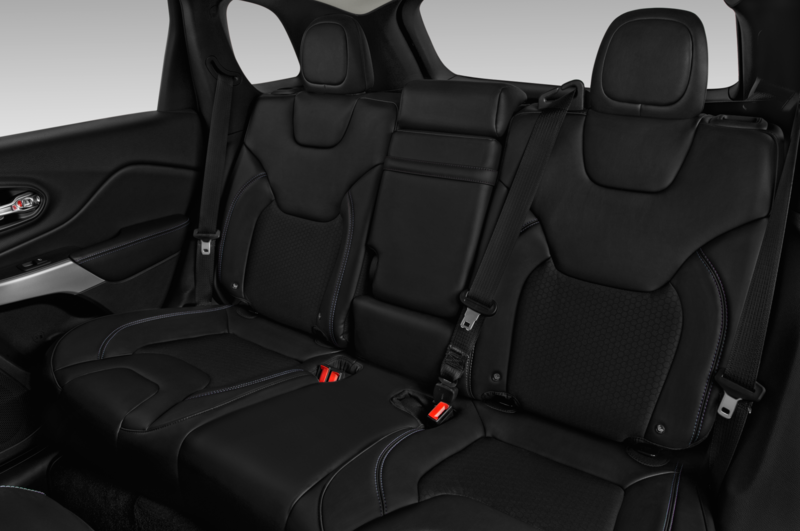 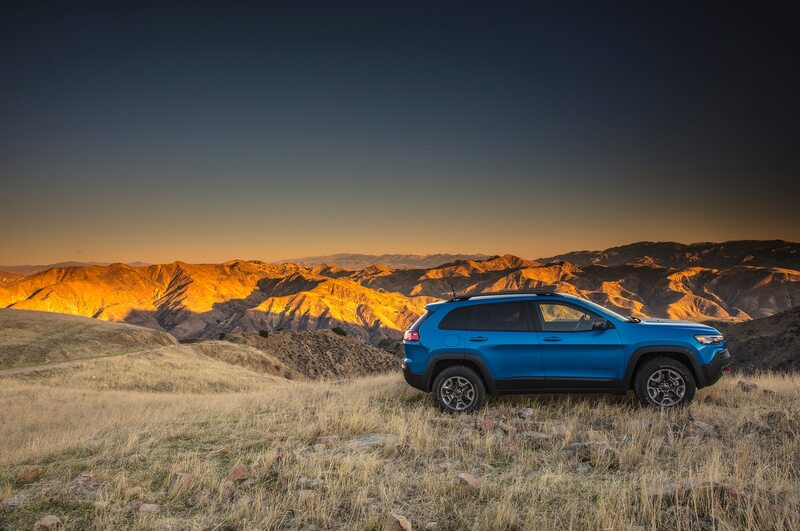 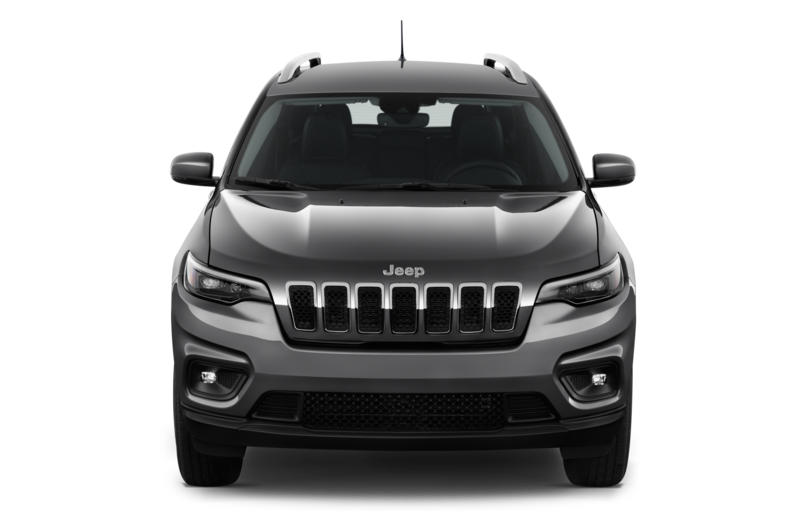 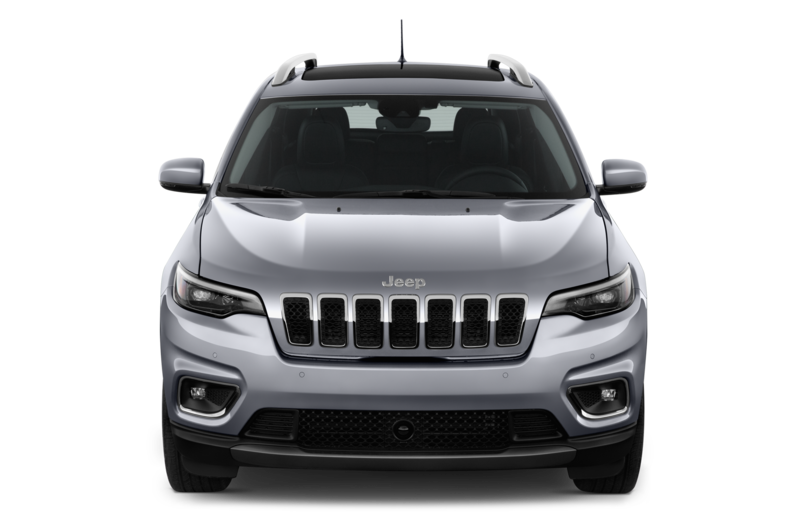 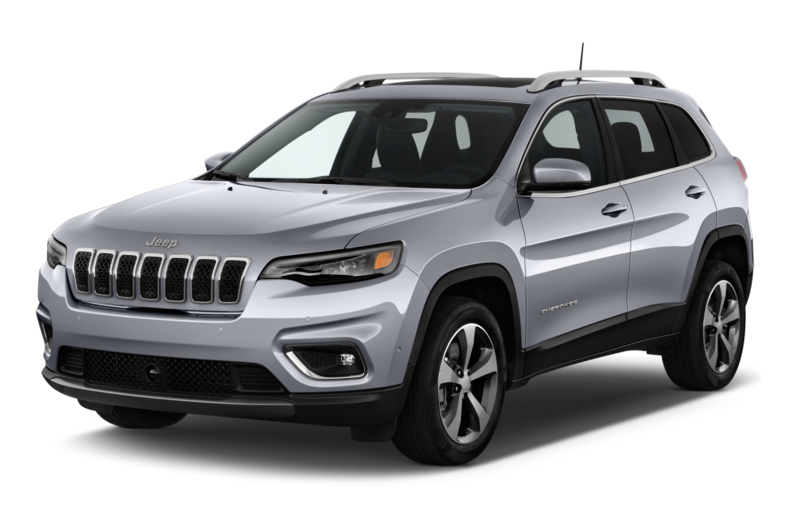 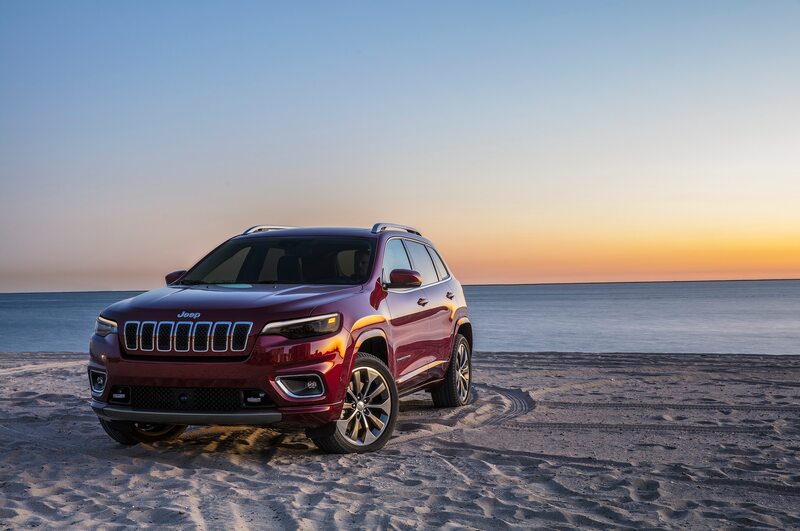 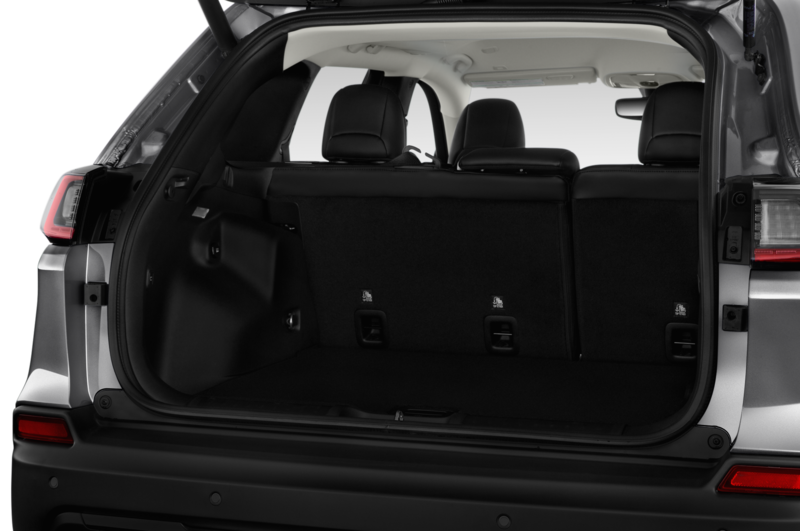 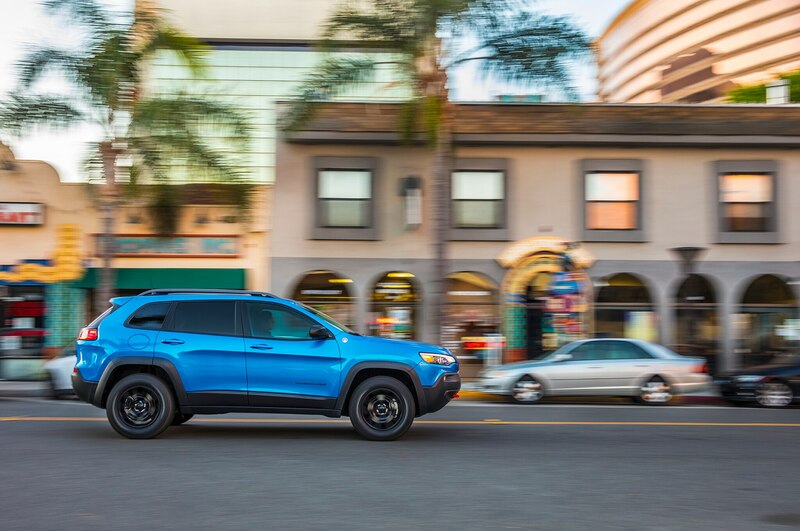 Standard gear includes Jeep’s Active Drive I all-wheel-drive system, keyless entry and start, heated front and rear leather seats (ventilated in front), a wood and leather steering wheel, 19-inch polished aluminum wheels, and a ParkView rear backup camera. 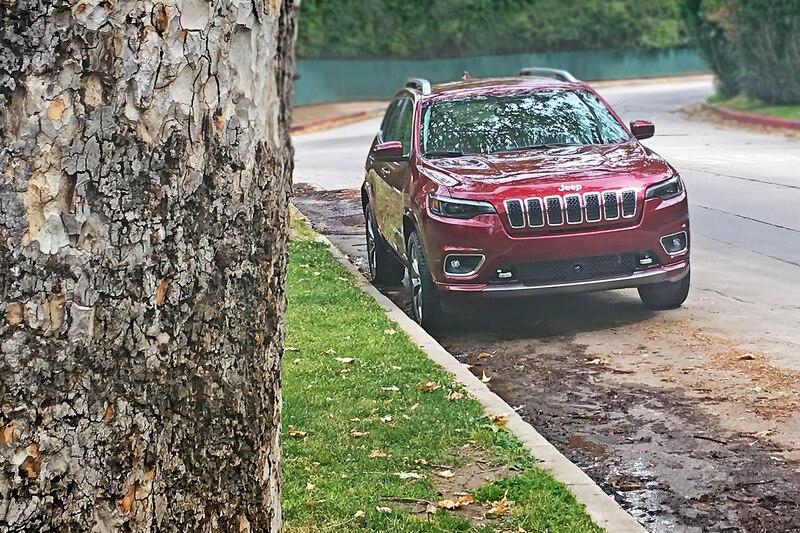 My tester also featured the optional Technology Package ($995), which adds such safety features as adaptive cruise with stop and go, lane-departure warning, collision warning with crash mitigation, and Parallel and Perpendicular automatic parking. 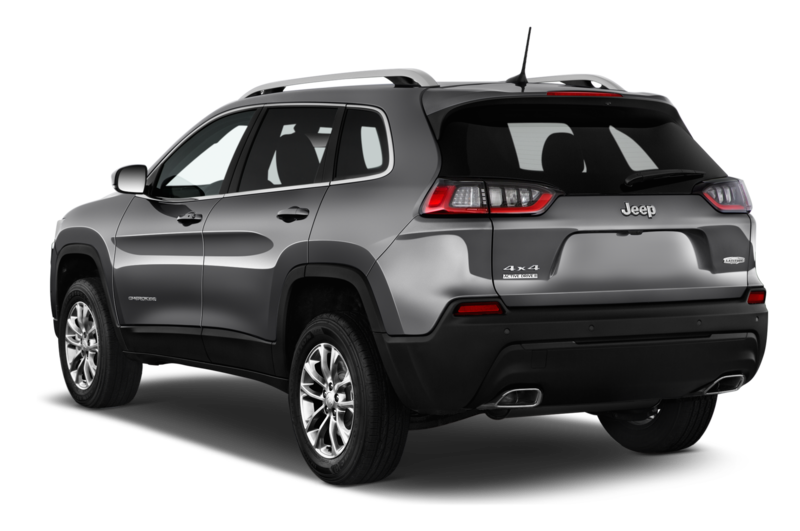 Total tab: a reasonable $40,215. 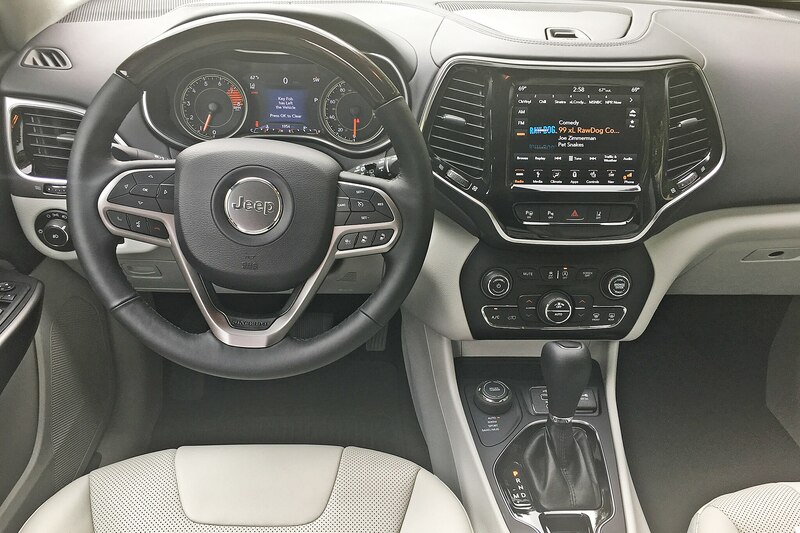 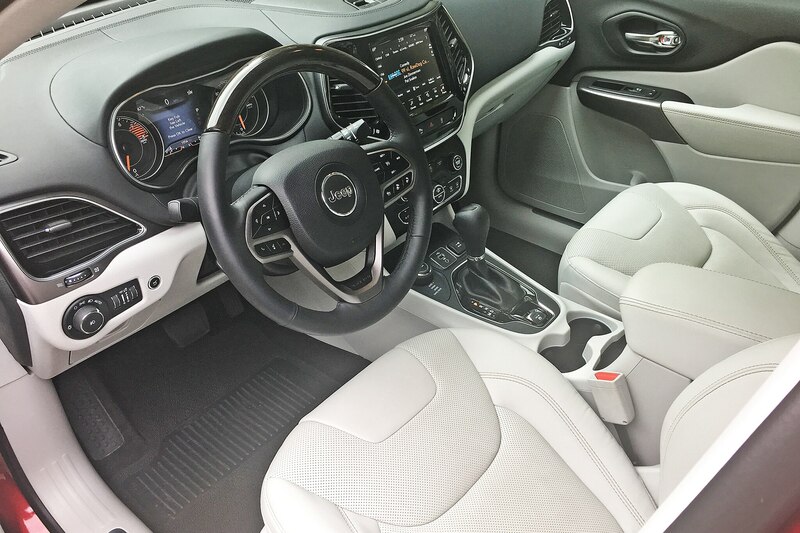 Some rivals—such as the Mazda CX-5 and the Honda CR-V—might have an edge in materials quality, but you’d be hard-pressed to find a more ergonomically friendly cockpit than the Cherokee’s. 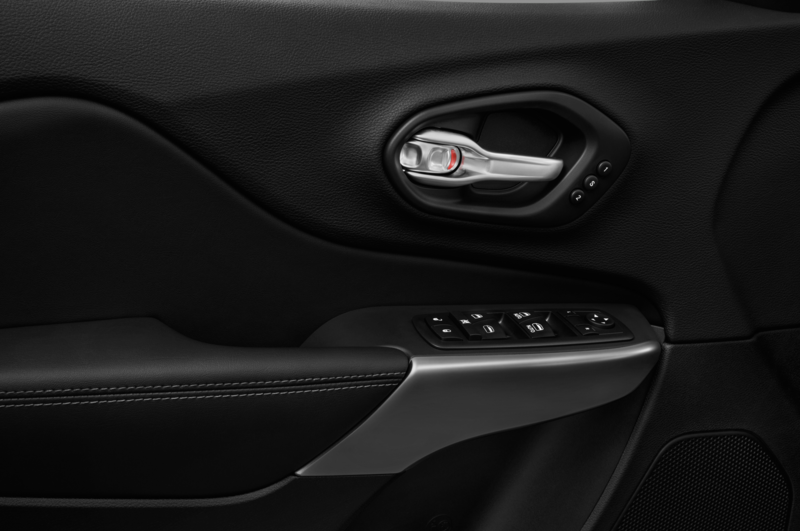 Everything is within easy reach and sensibly laid-out. 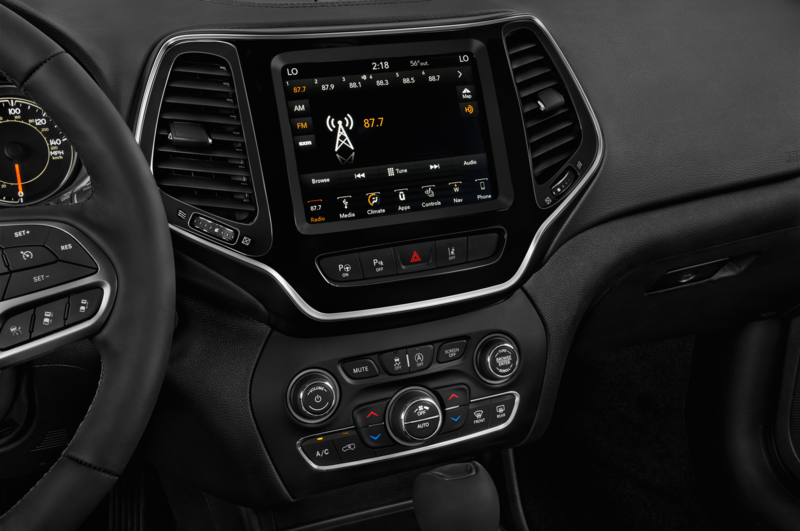 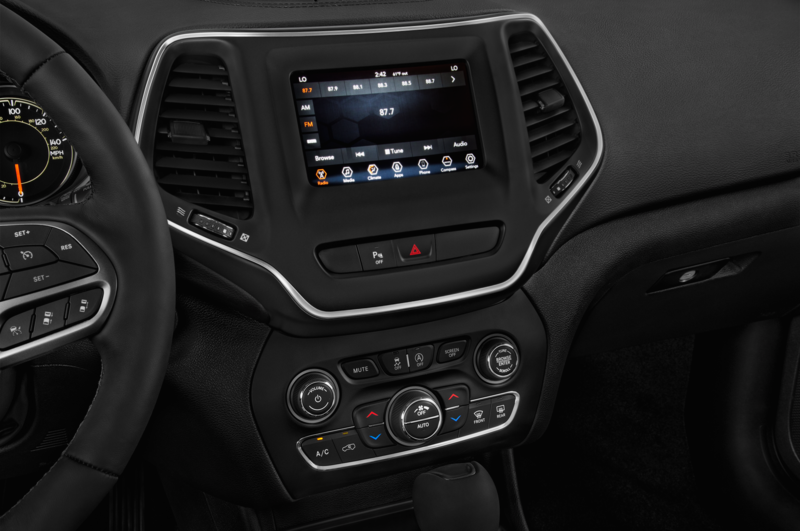 The 7-inch color touchscreen is a breeze to navigate (and works with Apple CarPlay and Android Auto). 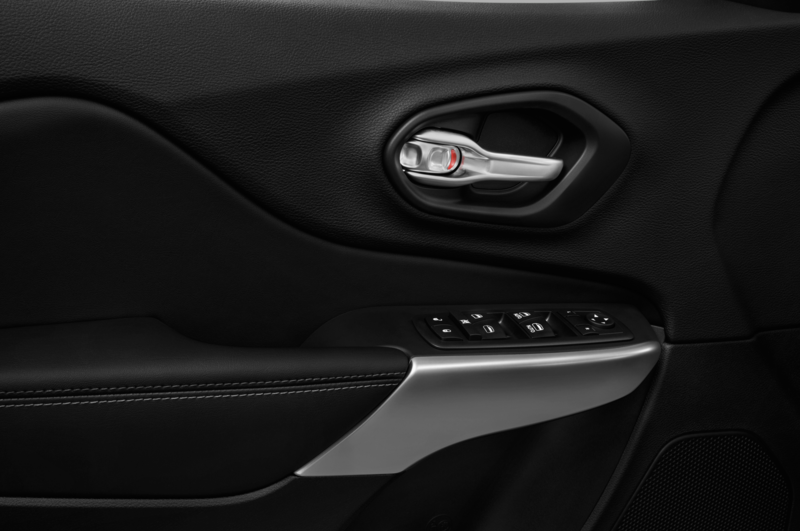 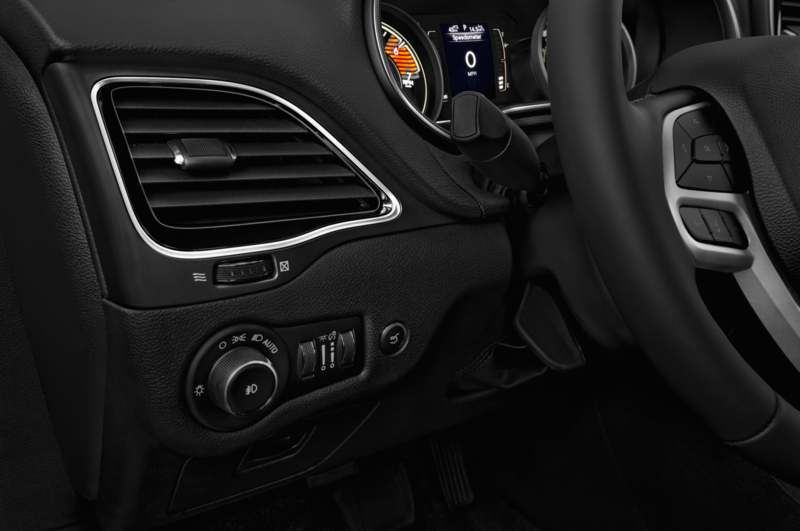 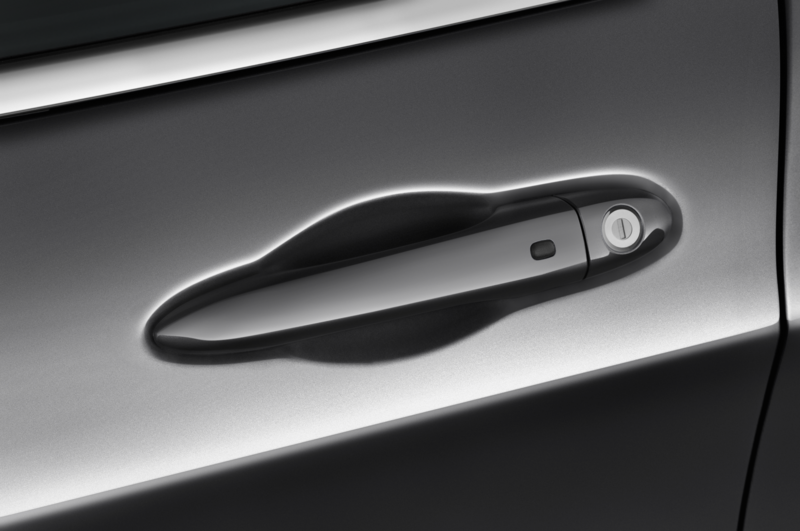 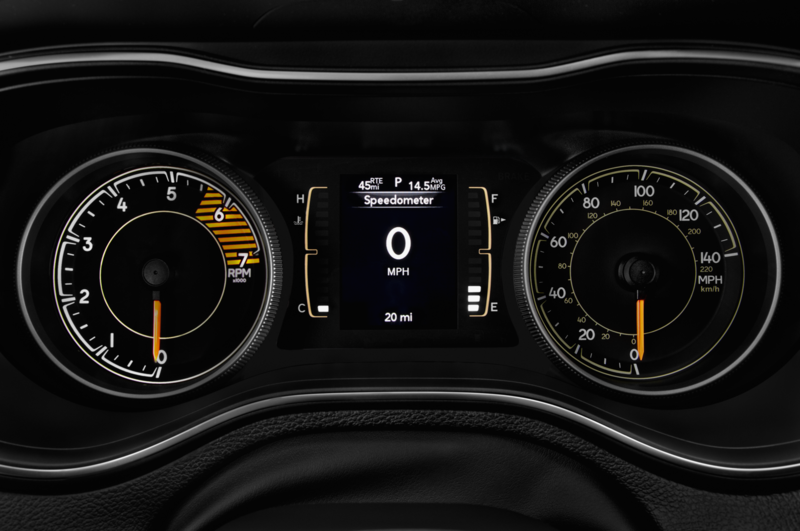 Conventional dials and buttons allow easy adjustment of climate settings. 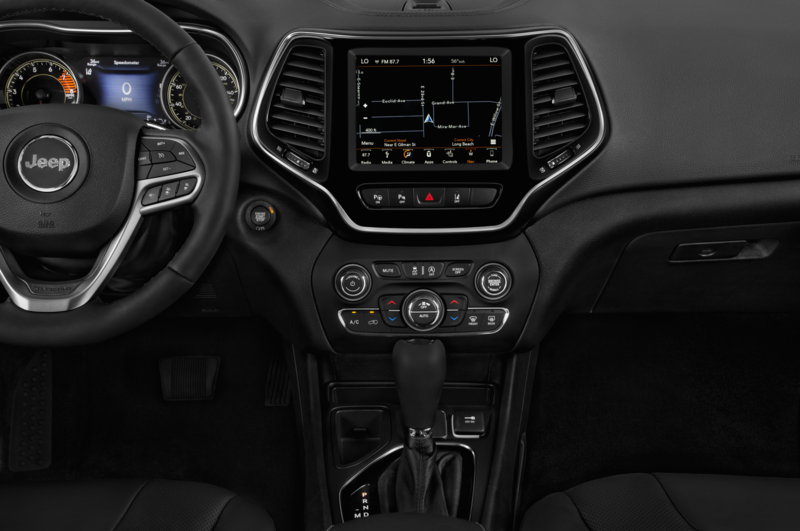 There’s a lot of tech on board, but that doesn’t translate into frustrations. 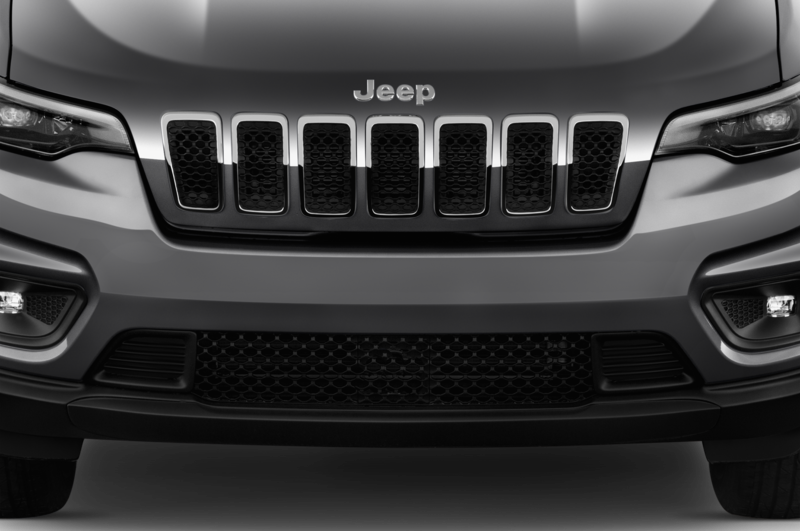 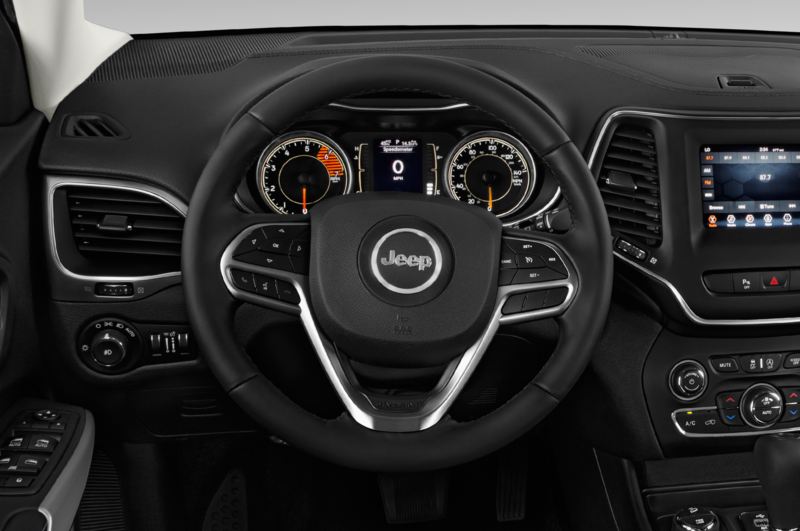 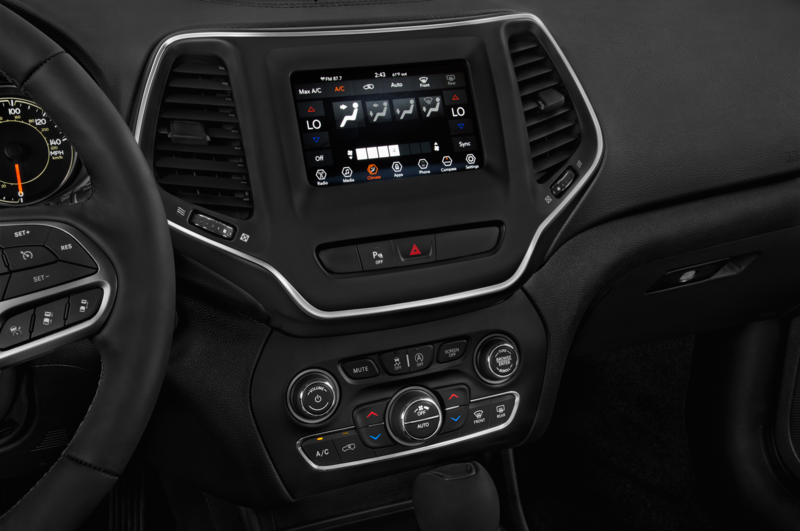 In a world of increasingly complex driver interfaces, the Jeep’s is a breath of un-polluted air. 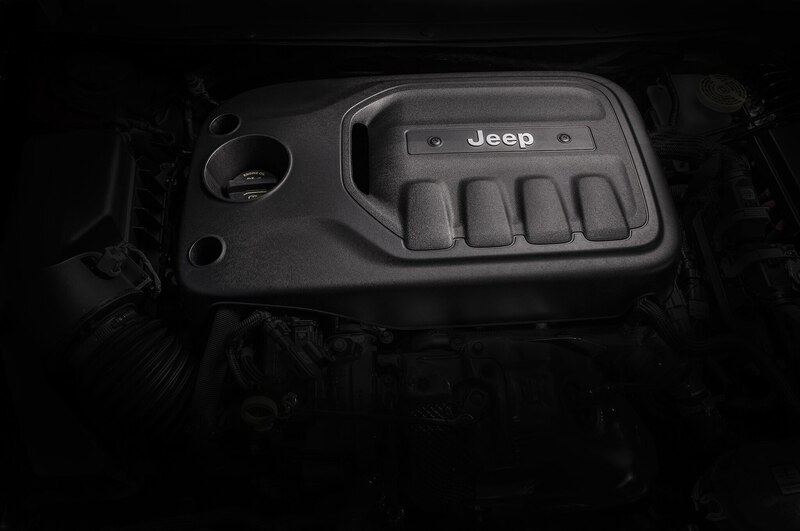 While a 2.0-liter turbo four is available, my test vehicle was equipped with the Overland’s standard 3.2-liter V-6. 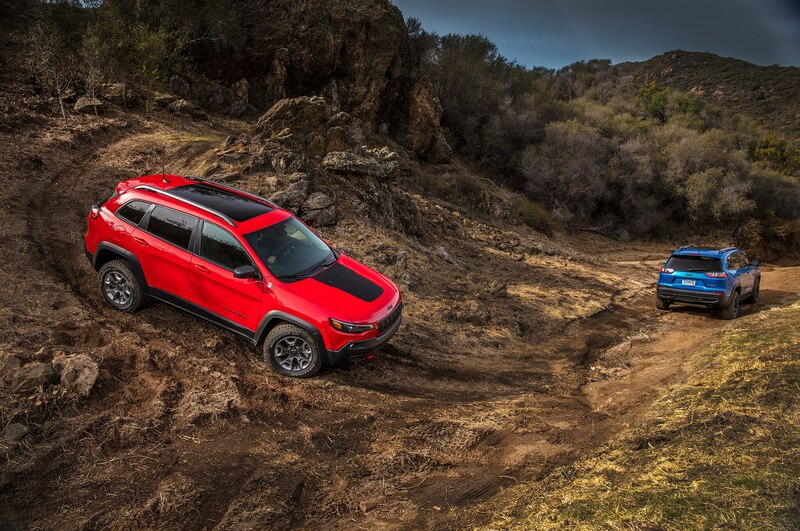 The turbo makes more torque (295 lb-ft versus the six’s 239) and delivers slightly better EPA fuel numbers, but the V-6 has a 500-pound towing advantage (4,500 pounds with the trailer-tow package). 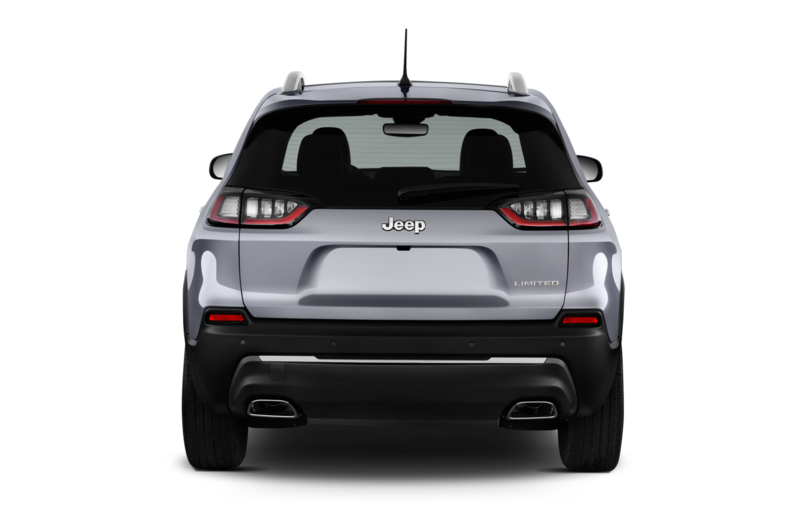 After a week prodding my right foot into the V-6, I’d say the turbo would have to be awfully sweet to get me to switch. 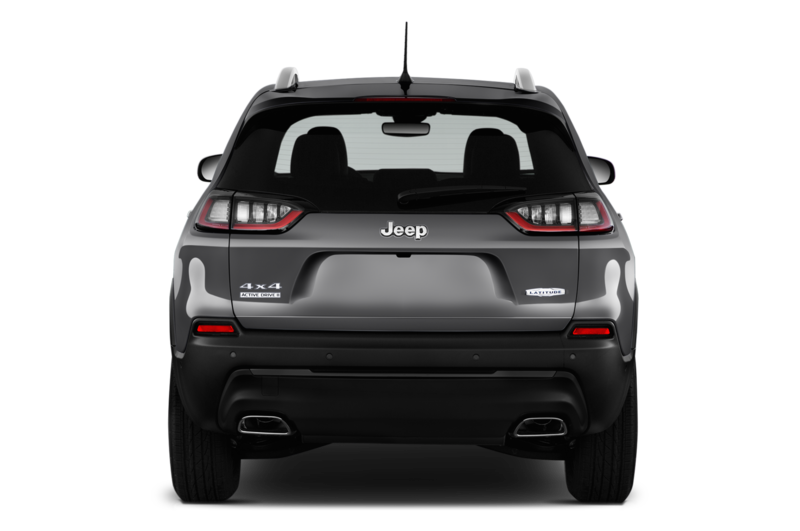 The six makes a rich, brawny exhaust note, pulls smartly from rest, and cruises over the highway with a purr. 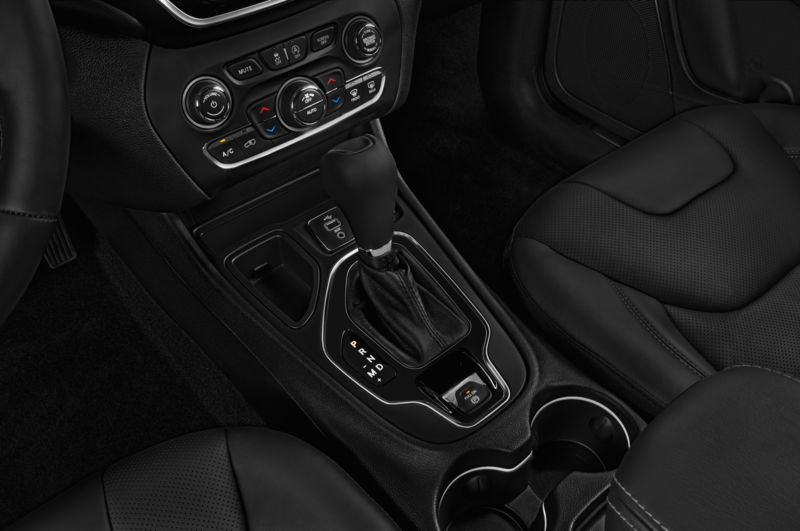 The standard transmission with either engine is a 9-speed automatic. 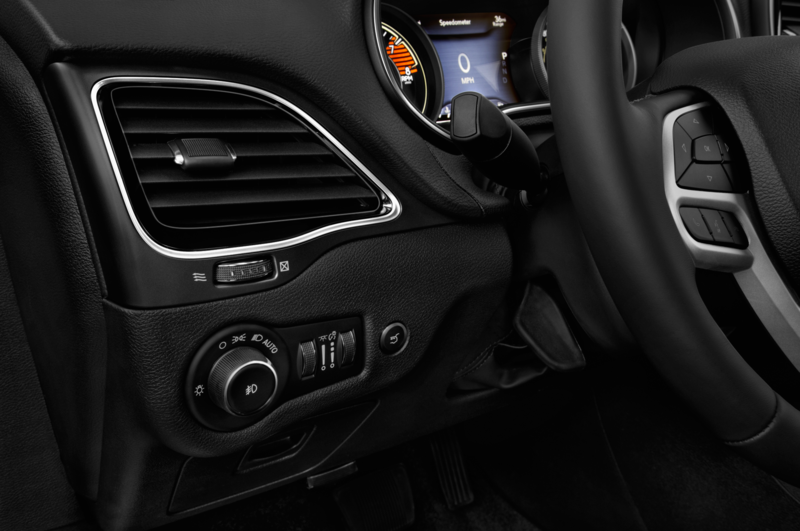 It’s a smooth shifter, but not the most responsive in gear changes. 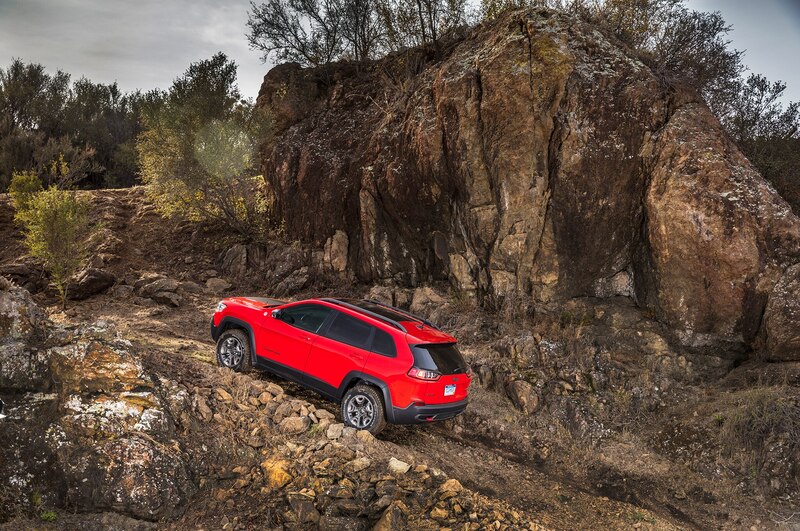 Then again, this isn’t a “speed” rig; it’s meant for cruising and off-roading. 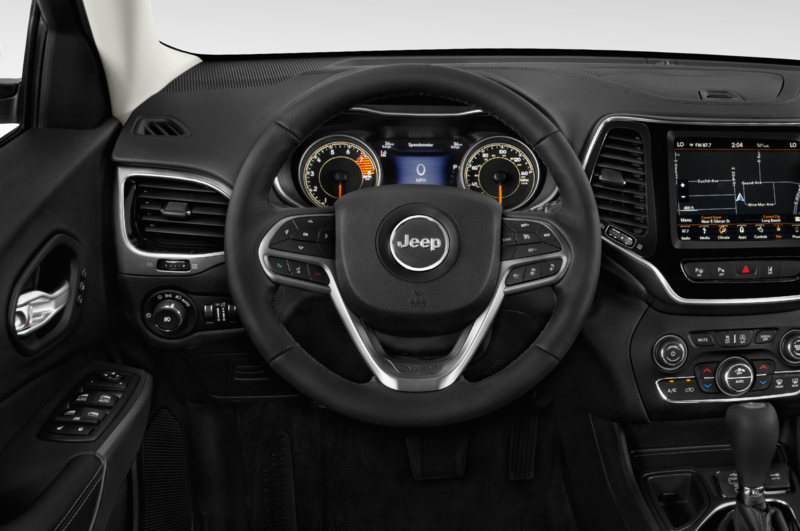 The Cherokee doesn’t even offer shift paddles. 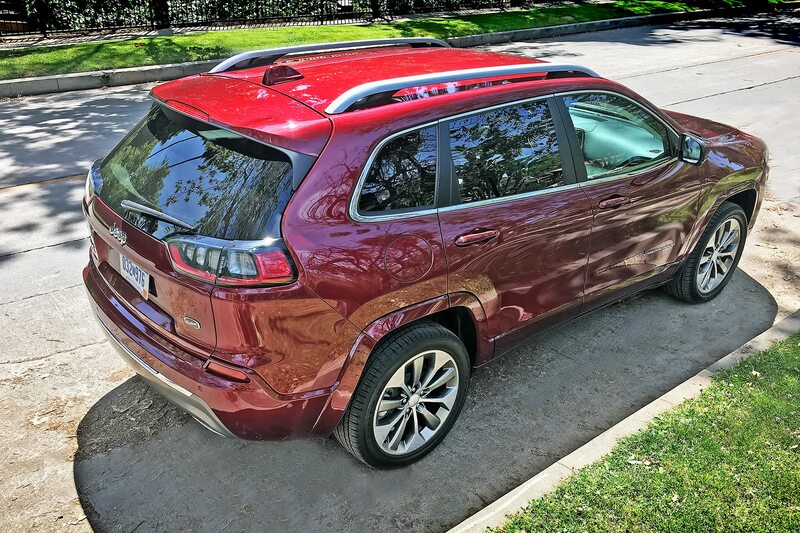 Ride quality is excellent—nicely controlled and free from harshness, even with the Overland’s 19-inch low-profile tires (lesser Cherokees start on 17s). 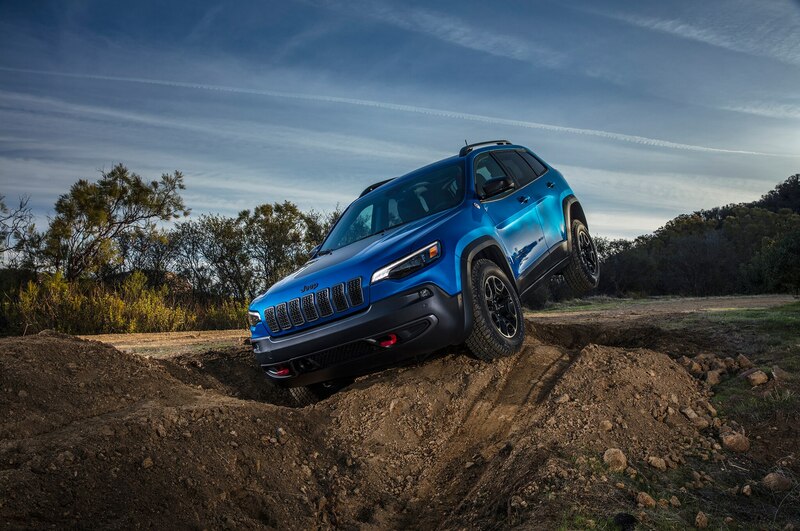 Credit a suspension with revised dampers and anti-roll bars and a structure said to be 150 pounds lighter the 2018 model. 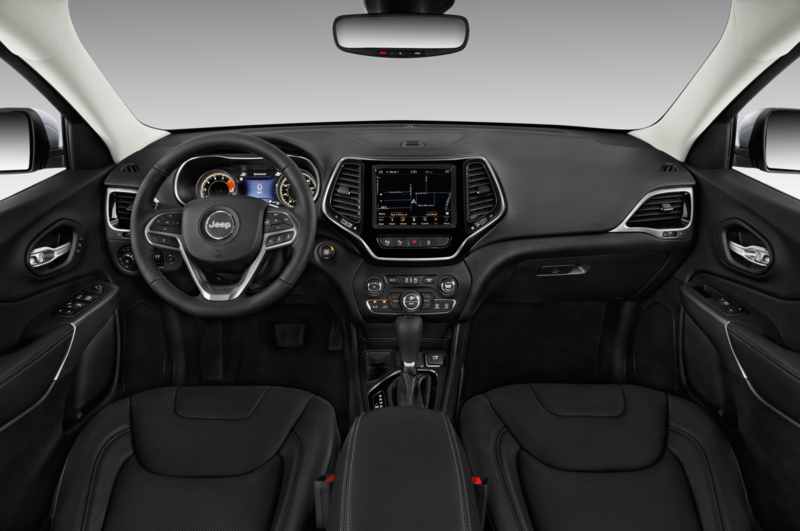 Steering feel is quite good (the 2019 gets a new, lightweight electronic steering system), while braking response is simply outstanding. 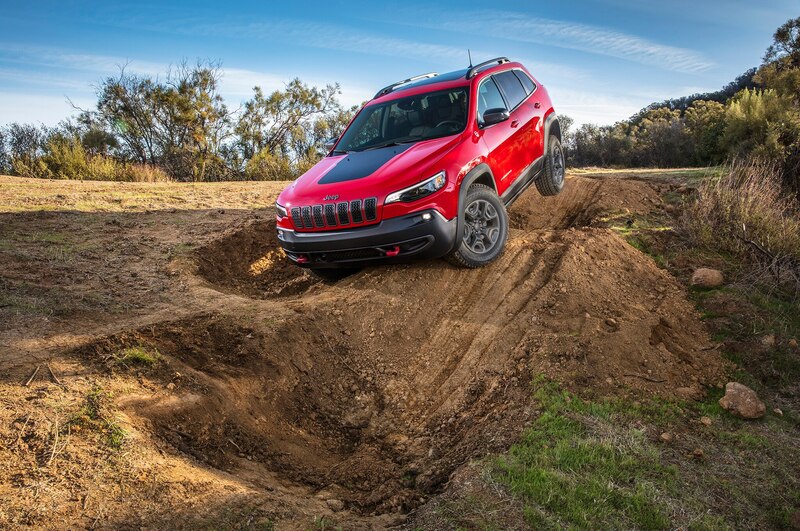 As enjoyable as it is to finesse the binders to perfect, jerk-free stops in town, creepy-crawling off-road would make the braking system’s delicate touch even more appreciated. 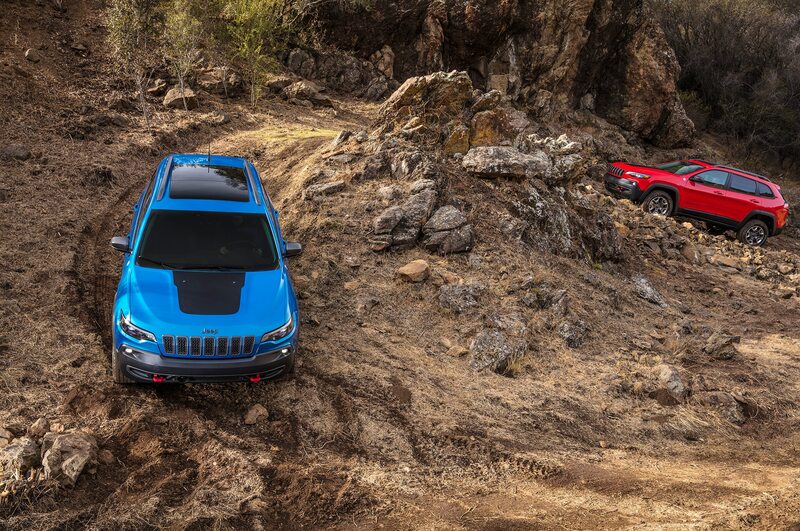 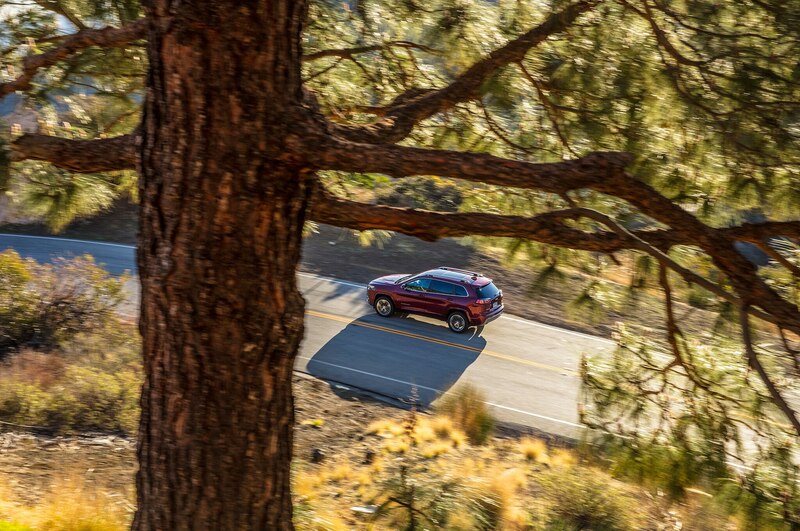 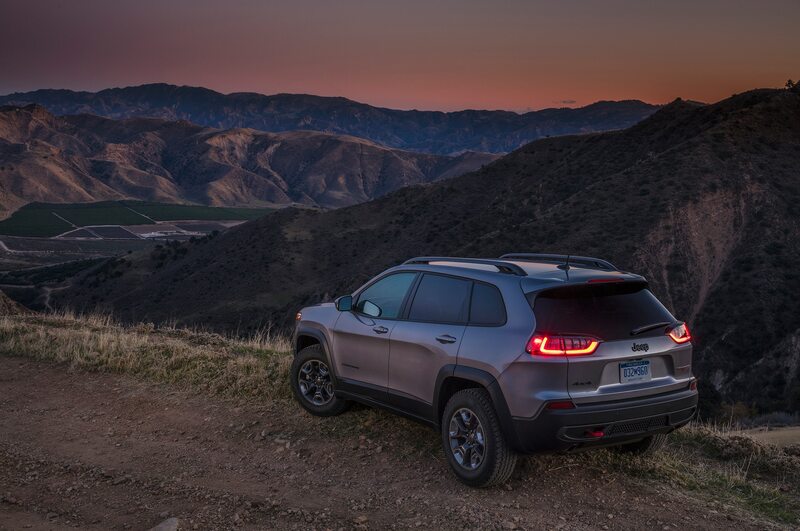 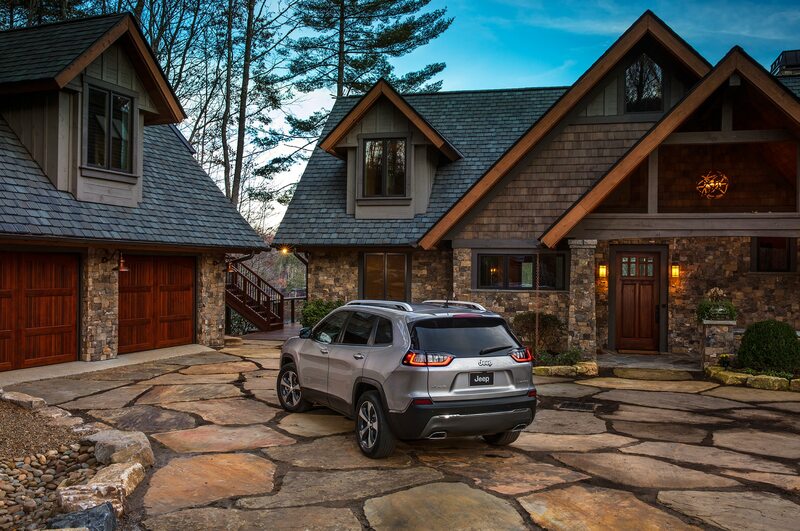 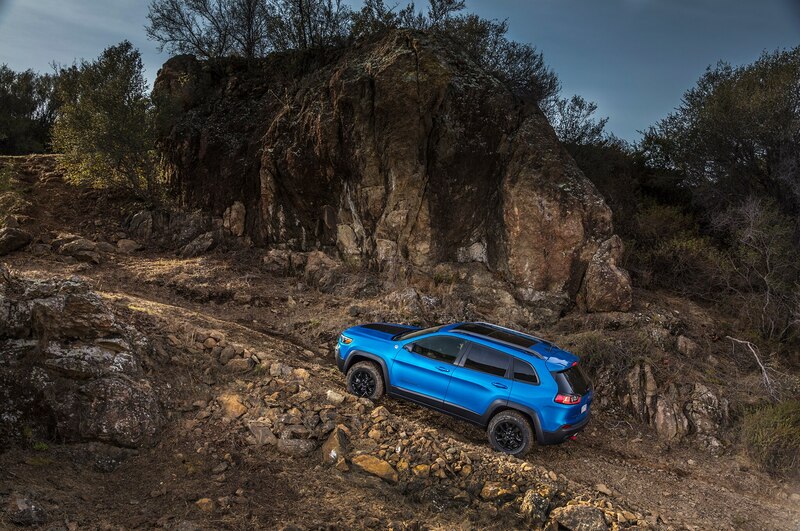 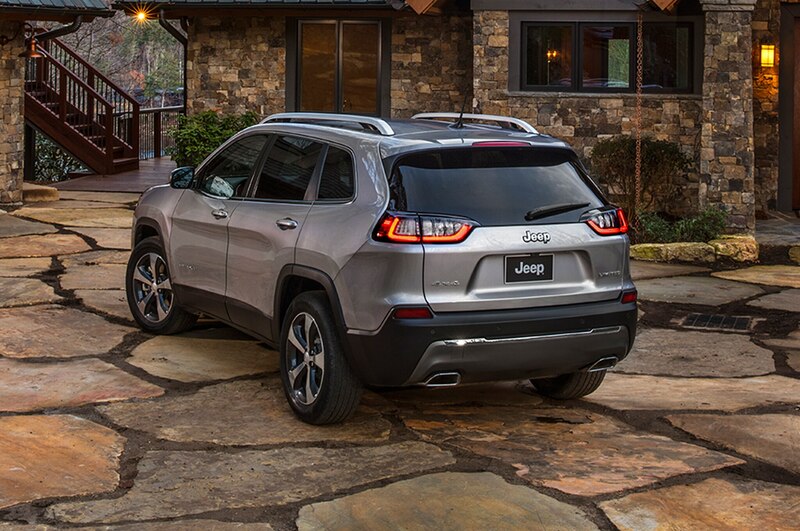 “Off-road.” Those are two key words one can’t forget when sizing-up this Cherokee. 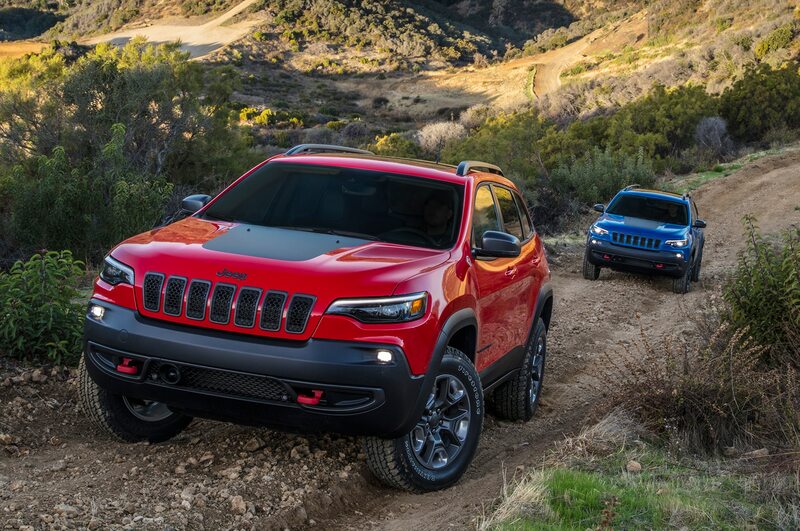 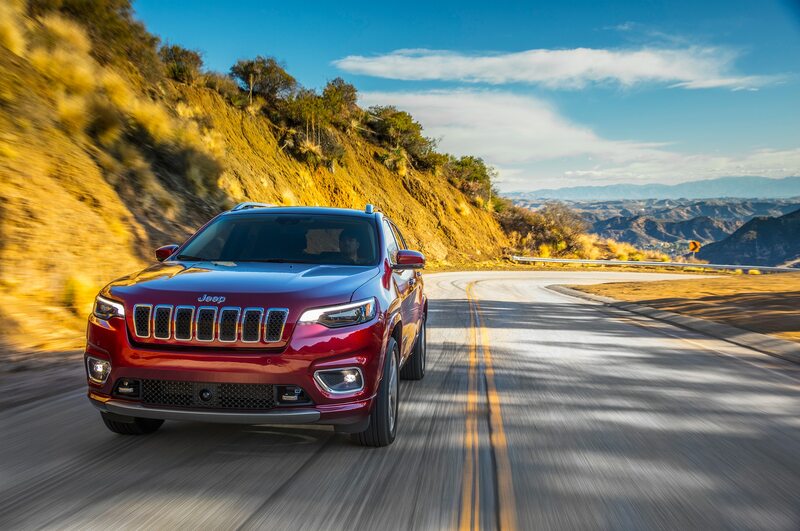 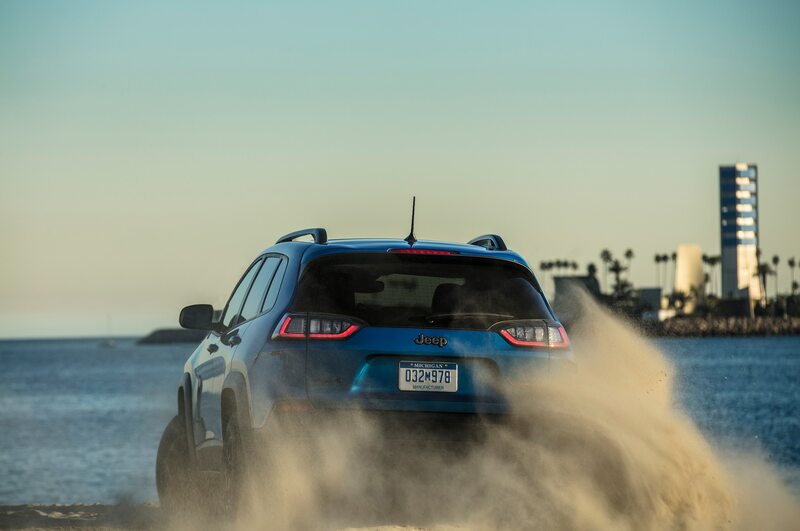 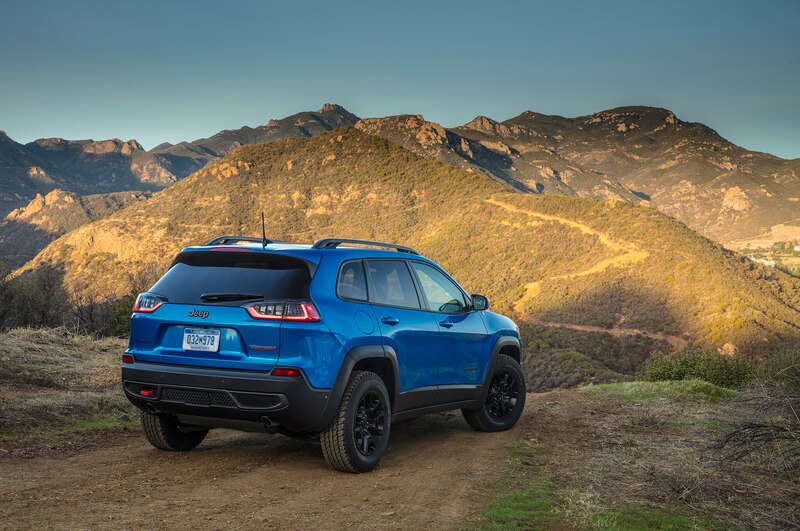 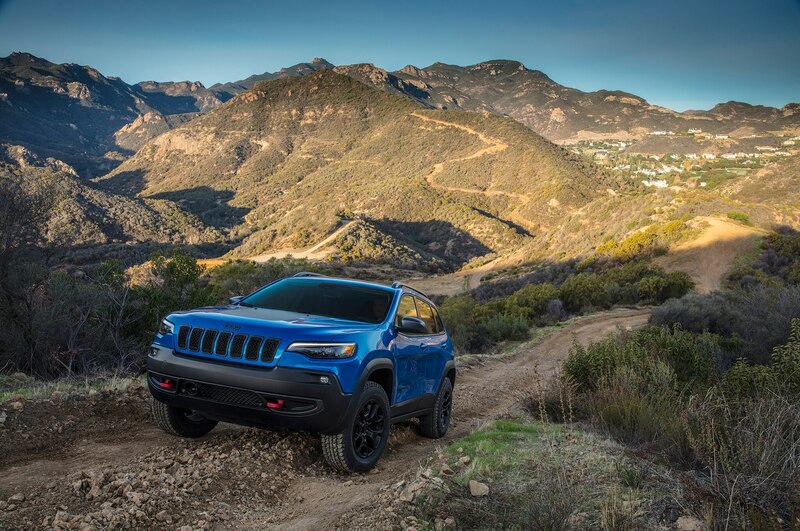 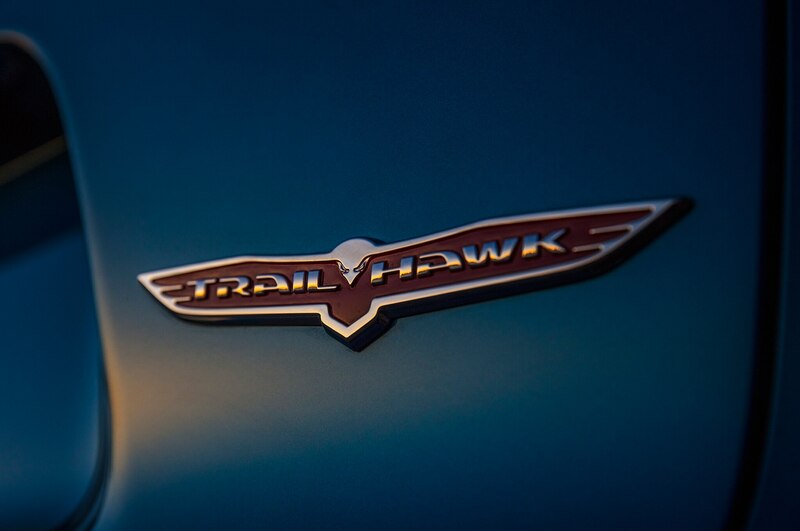 Because, let’s face it: While rivals from Honda, Mazda, and Kia may be just fine in civilized society, when the tarmac disappears the Cherokee will leave them all wheezing in its dust. 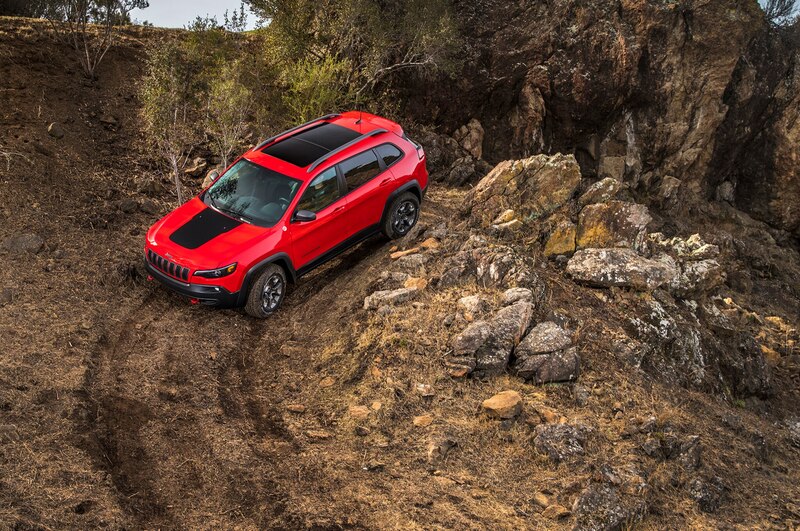 This is, after all, a bona-fide Jeep. 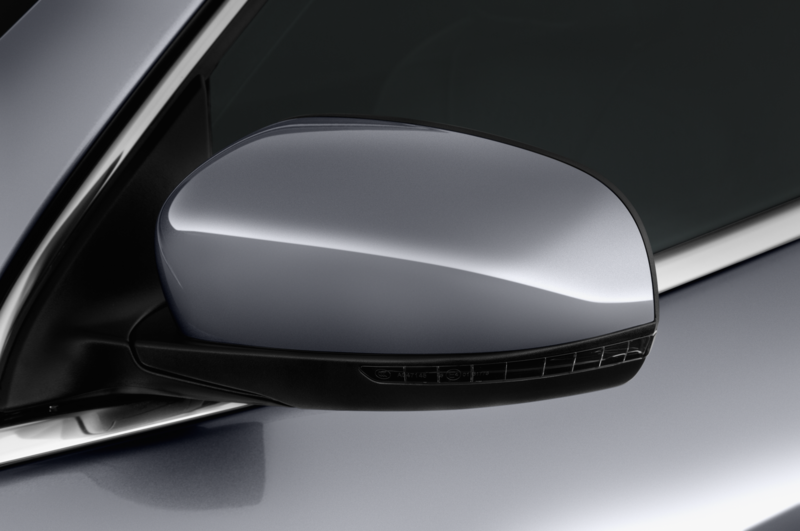 Approach angle is a generous 29.9 degrees; departure angle checks in at 32.2. 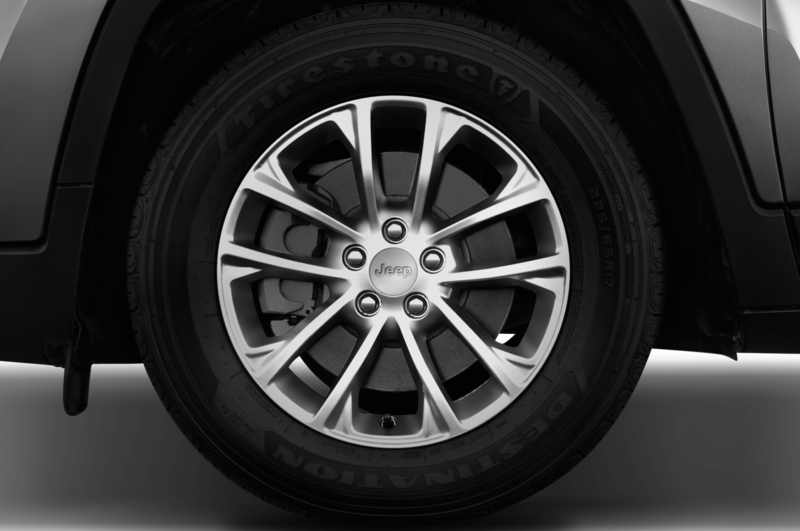 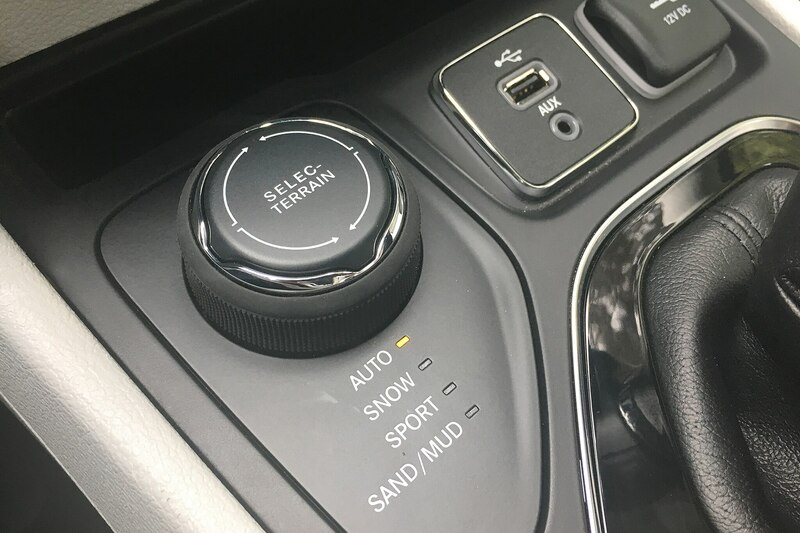 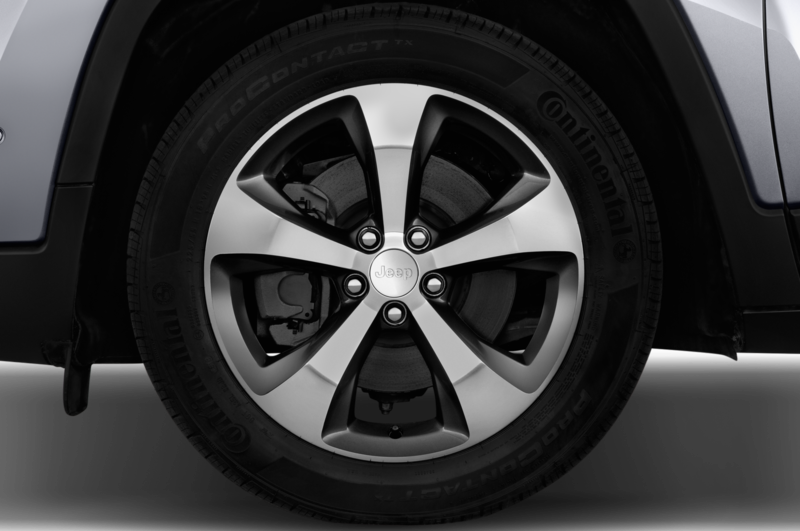 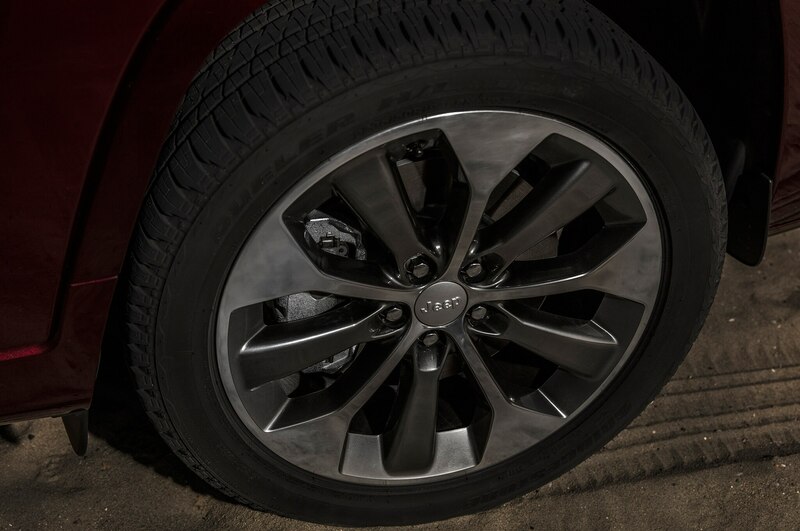 And you’ve got the right tech: Selec-Terrain system (which allows you to configure the vehicle’s response for a variety of conditions such as snow and sand/mud), Hill-Start assist, all-speed traction control, and electronic stability control. 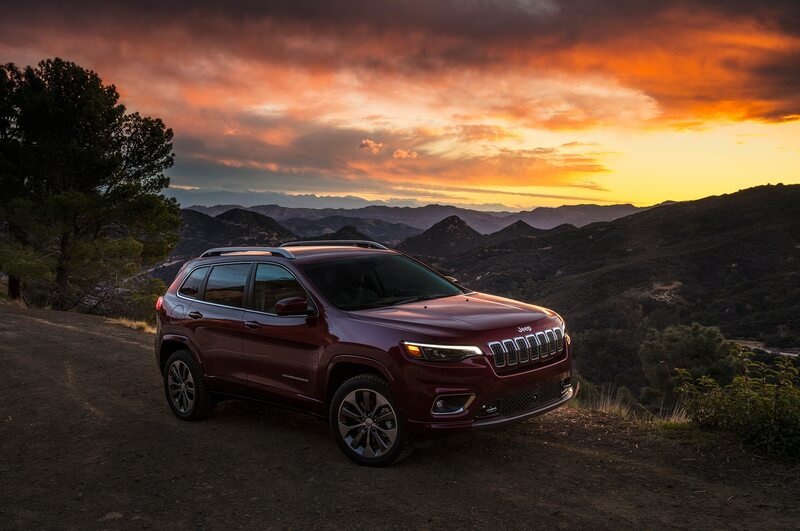 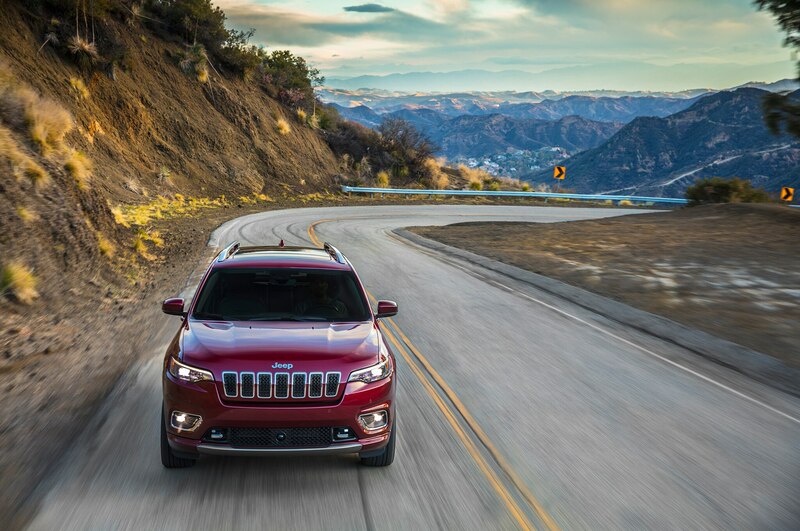 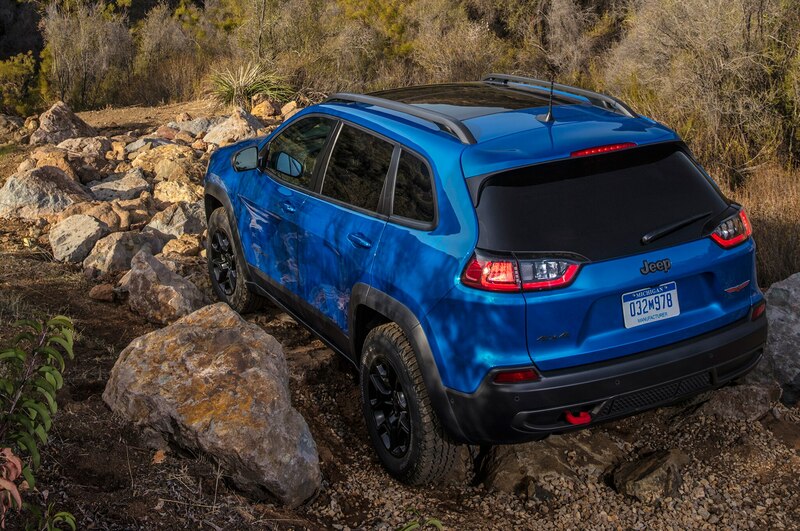 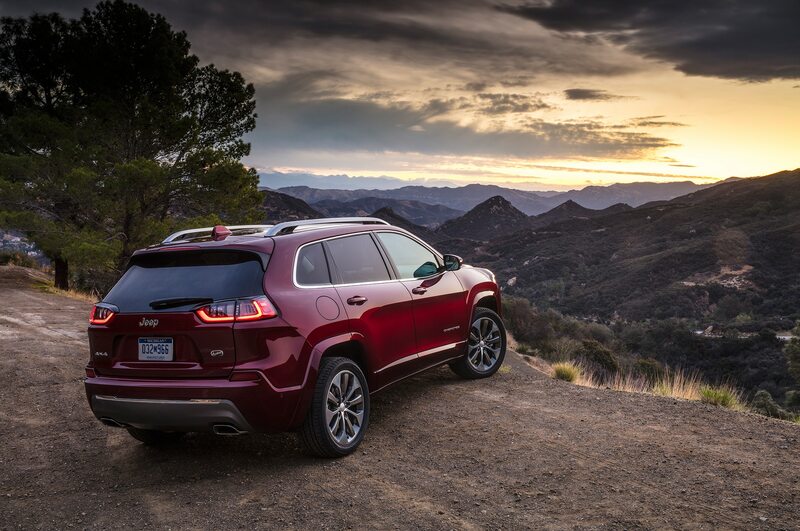 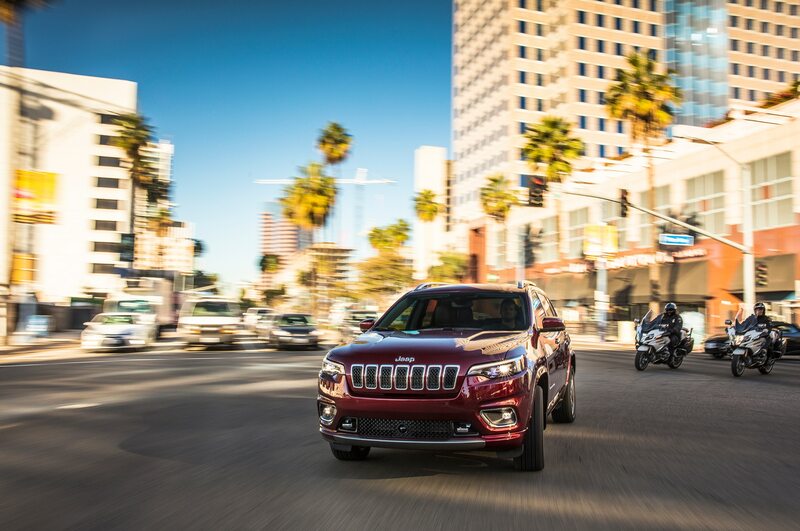 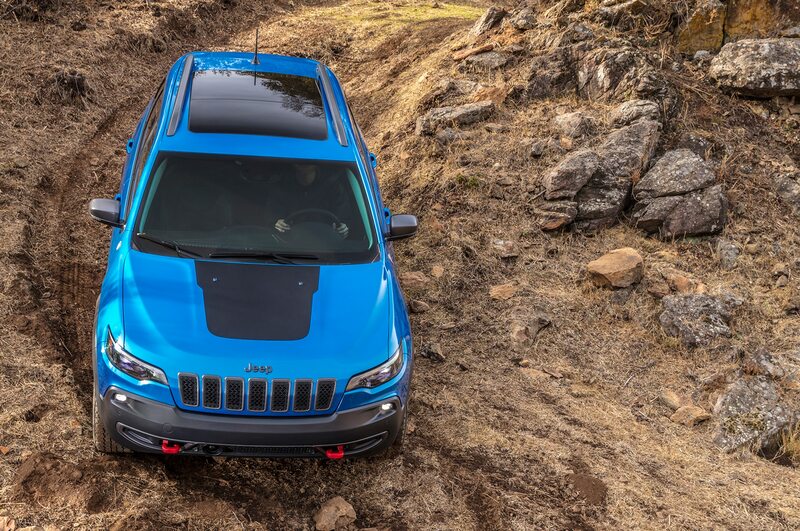 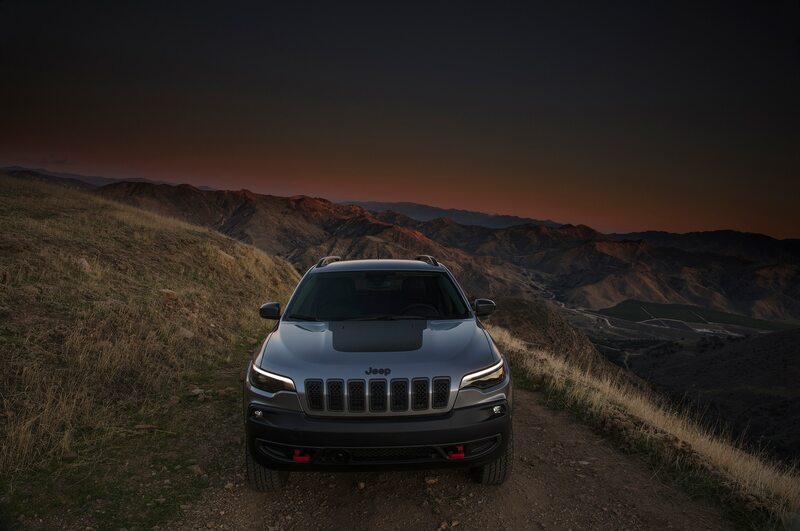 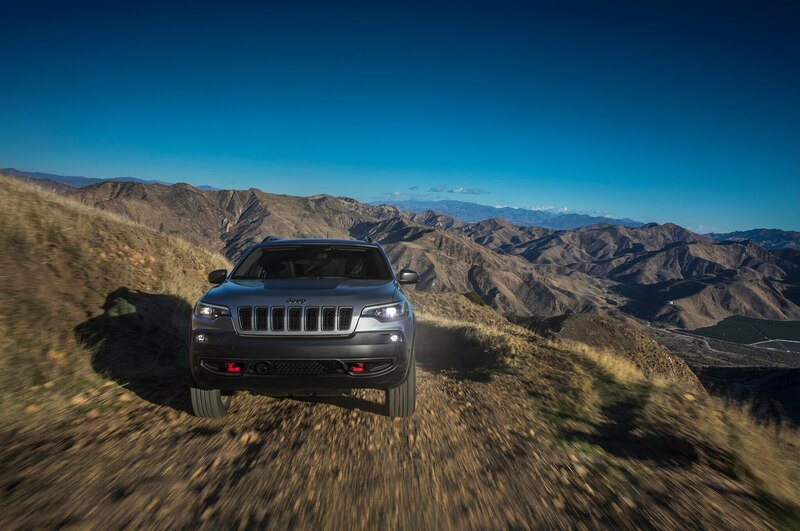 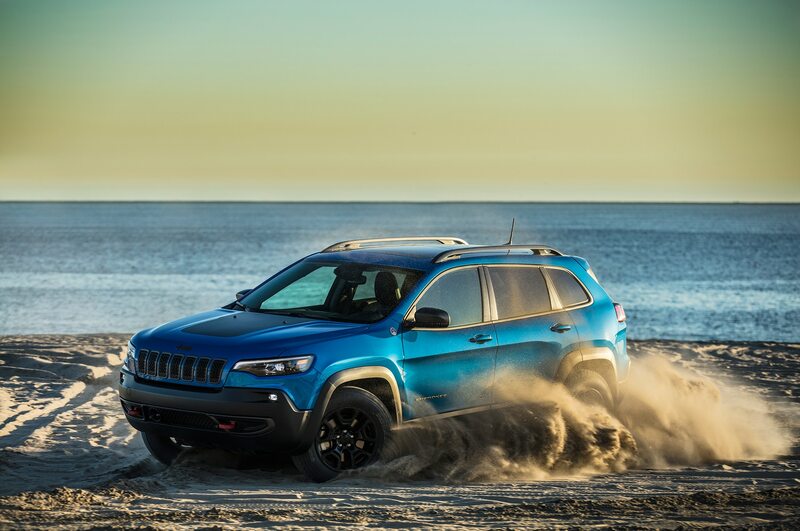 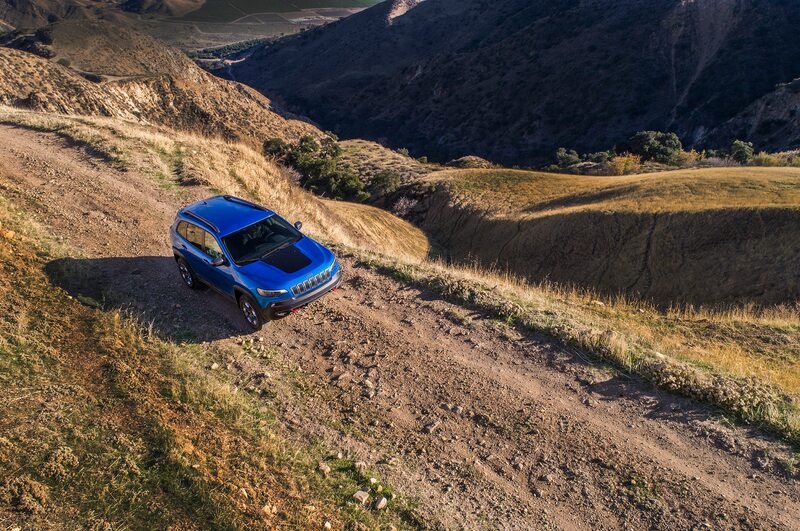 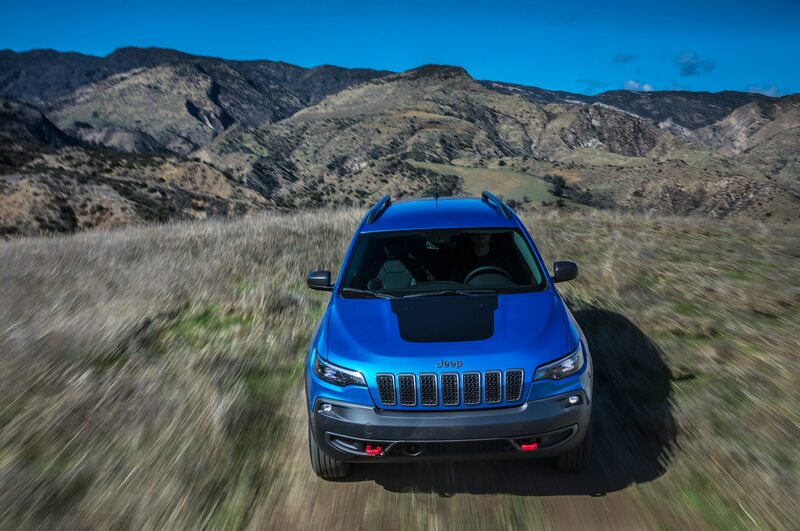 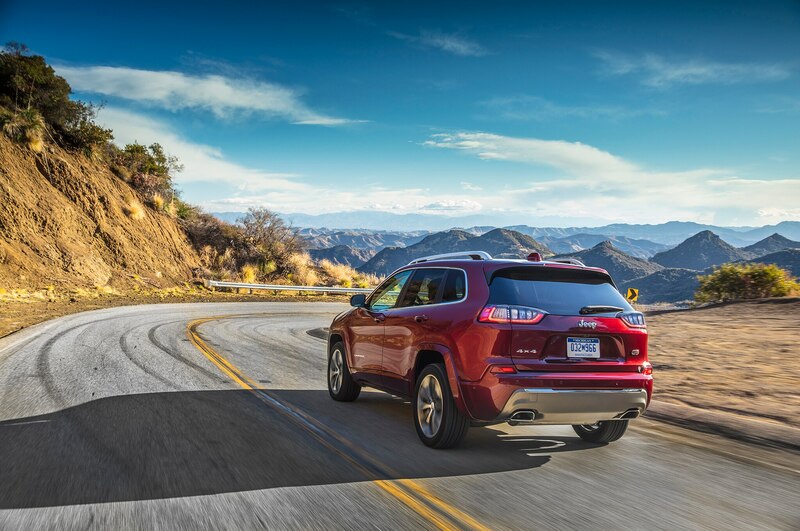 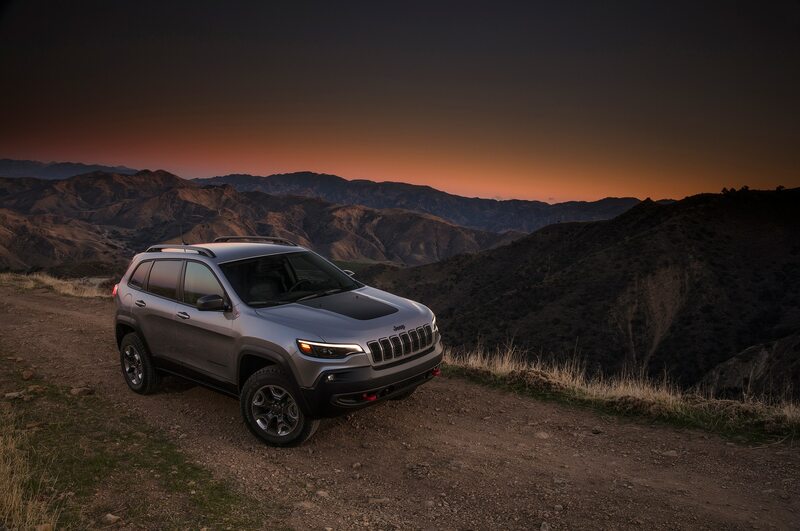 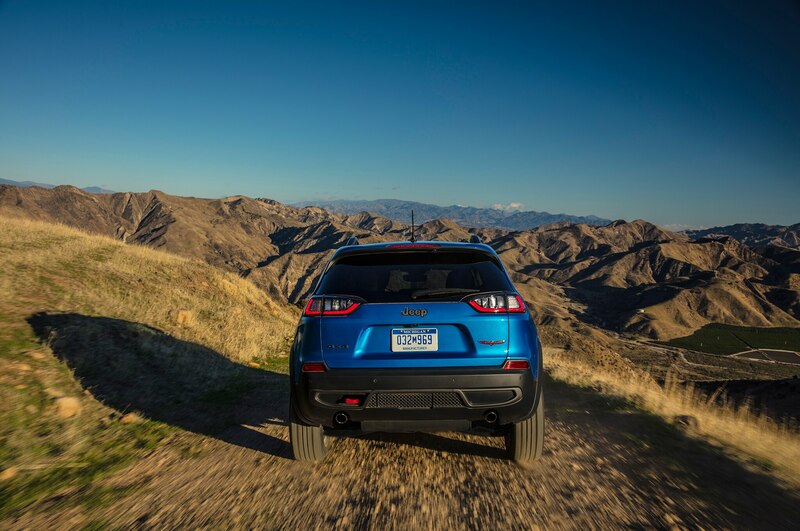 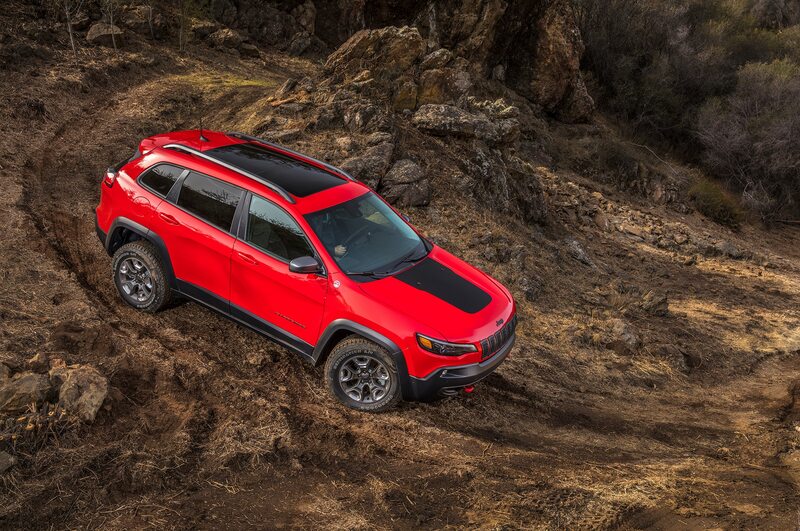 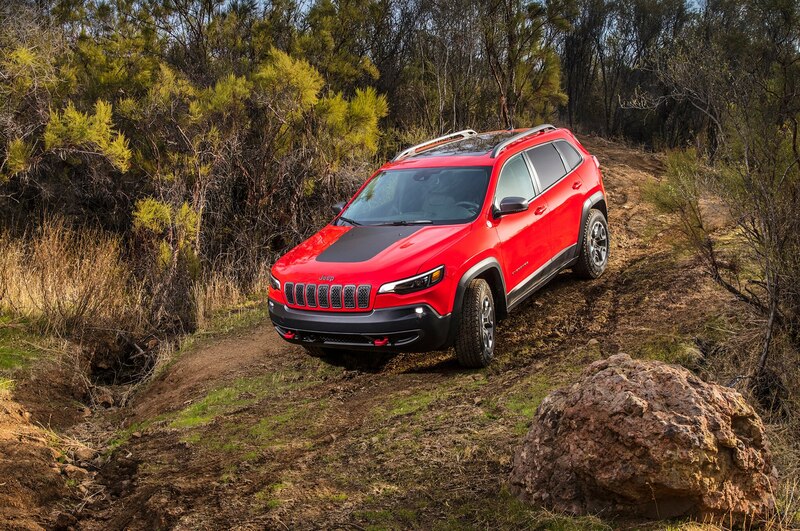 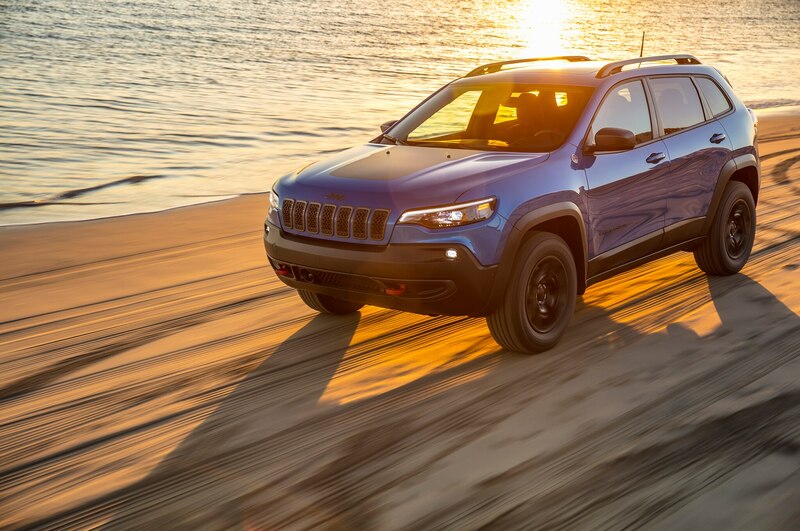 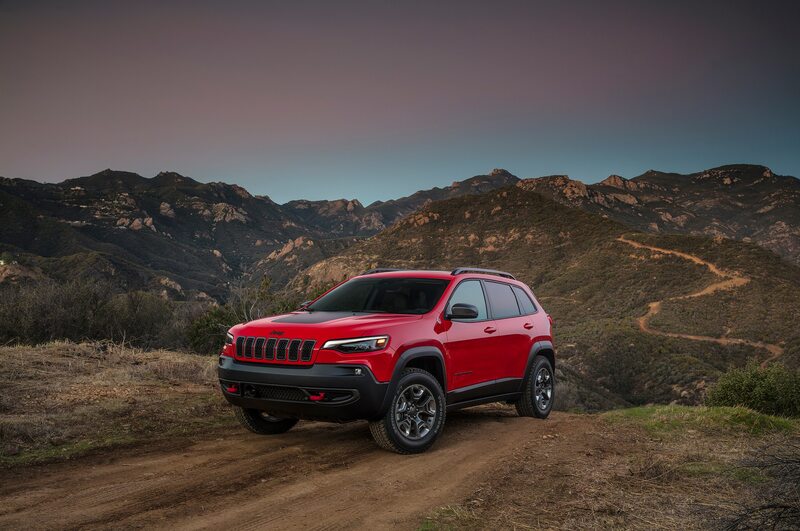 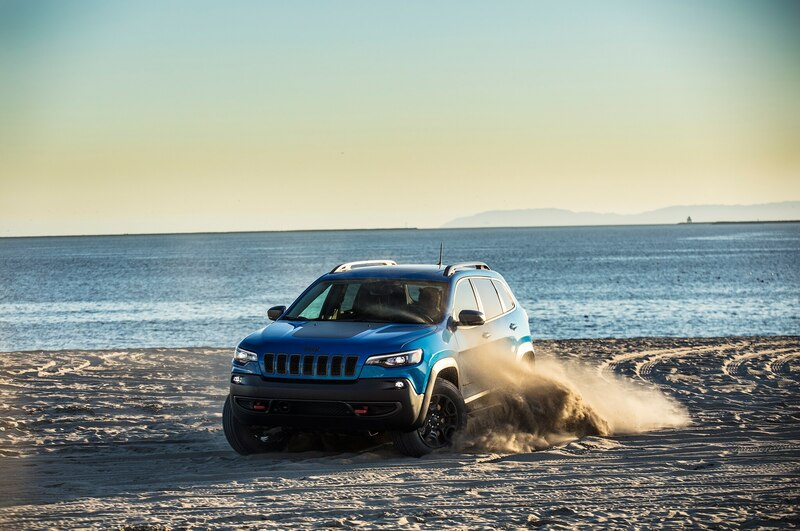 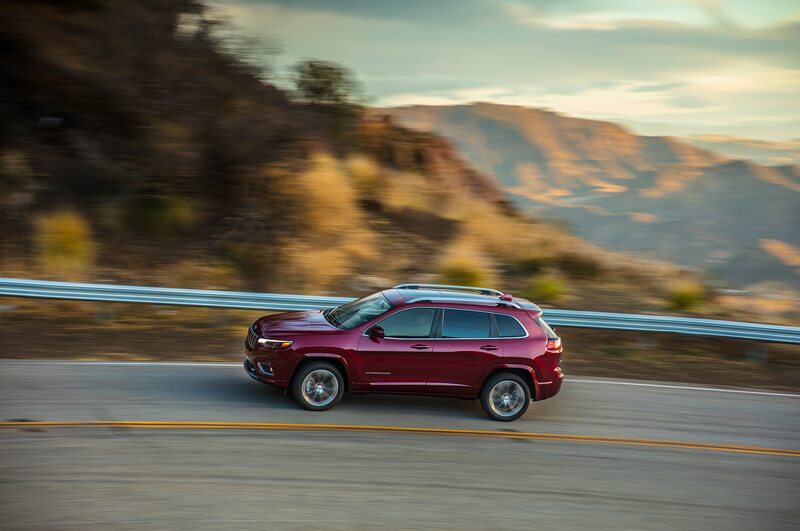 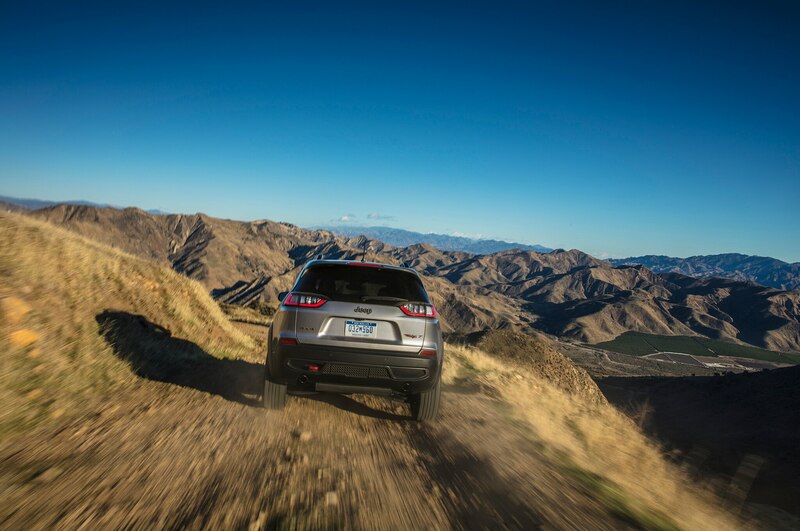 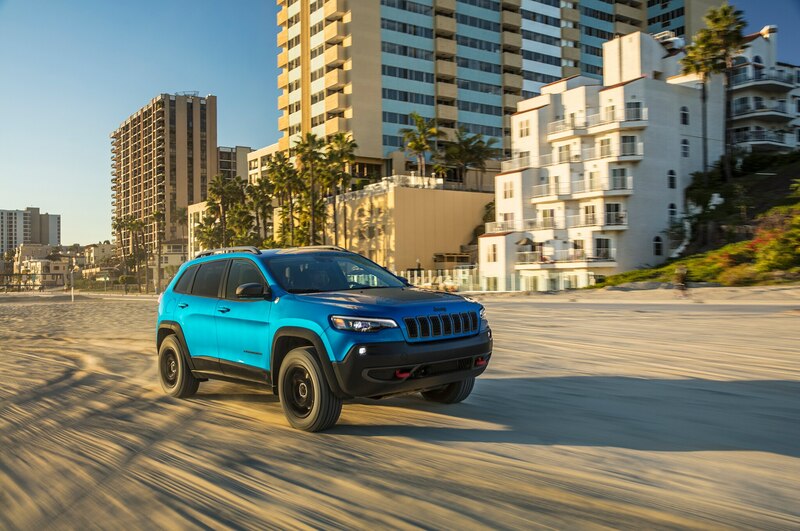 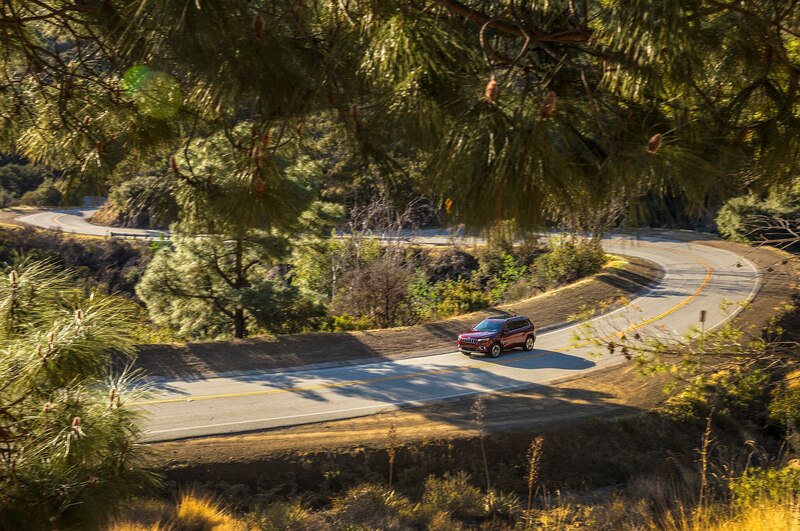 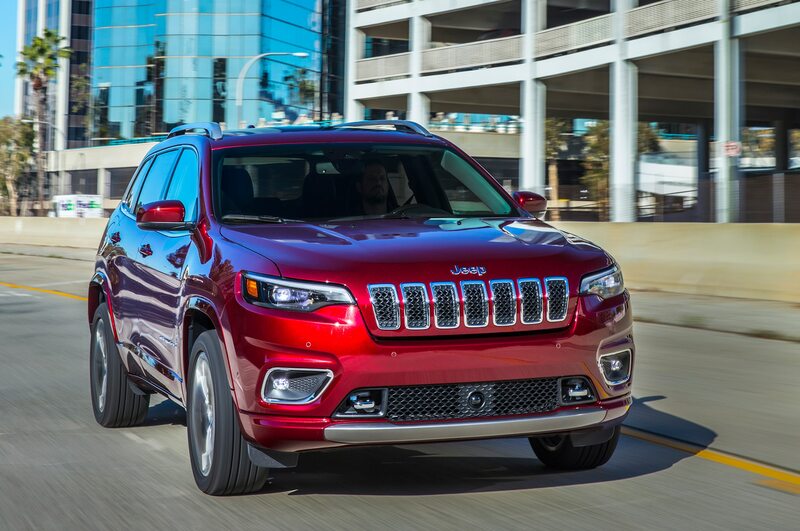 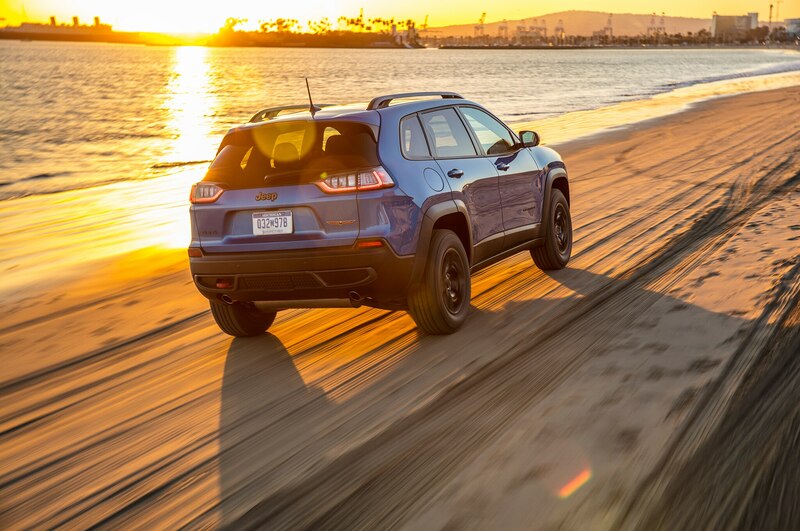 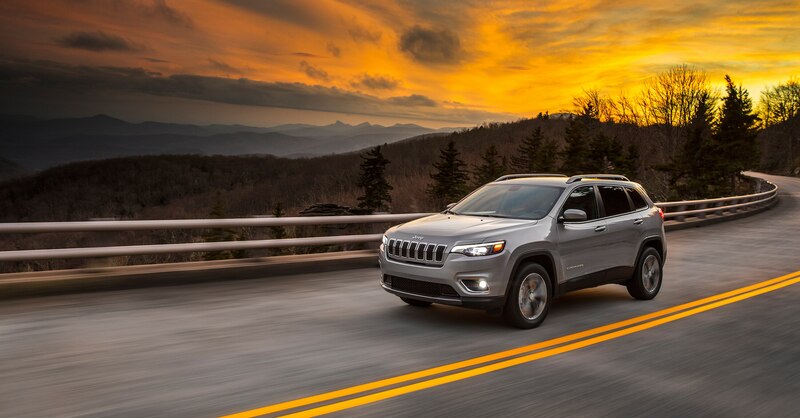 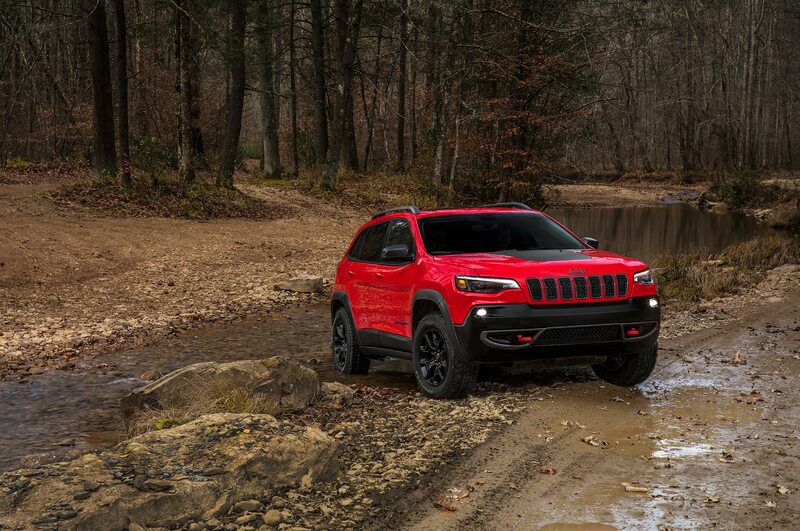 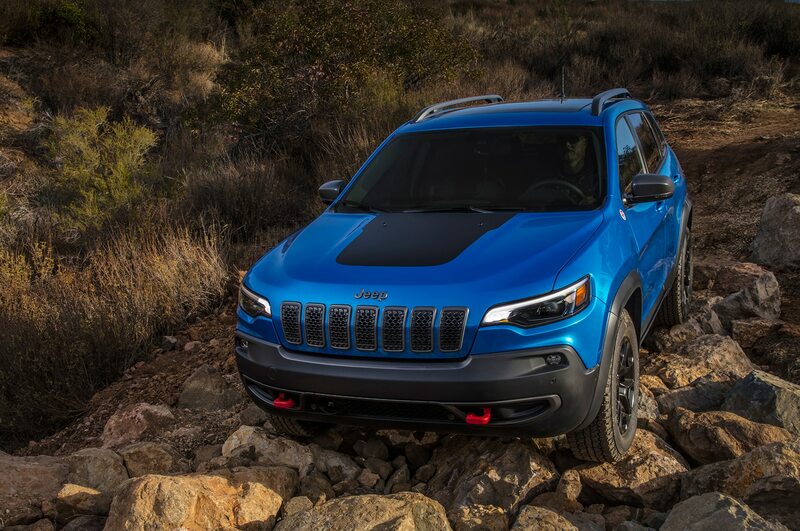 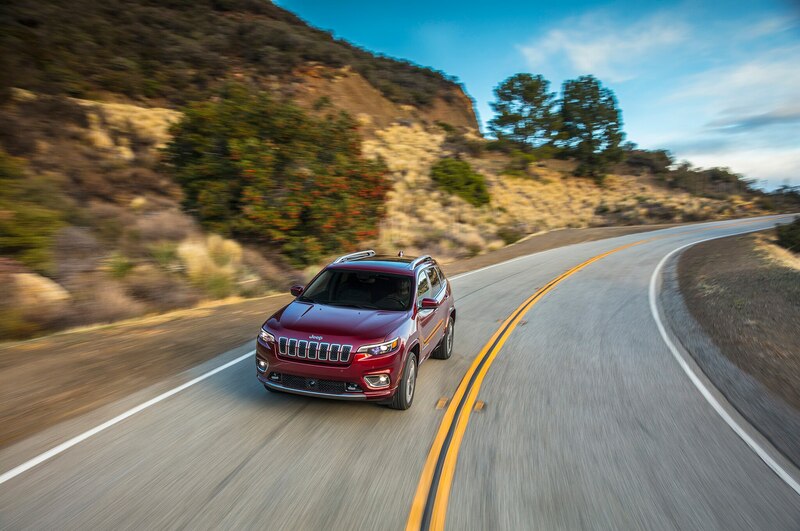 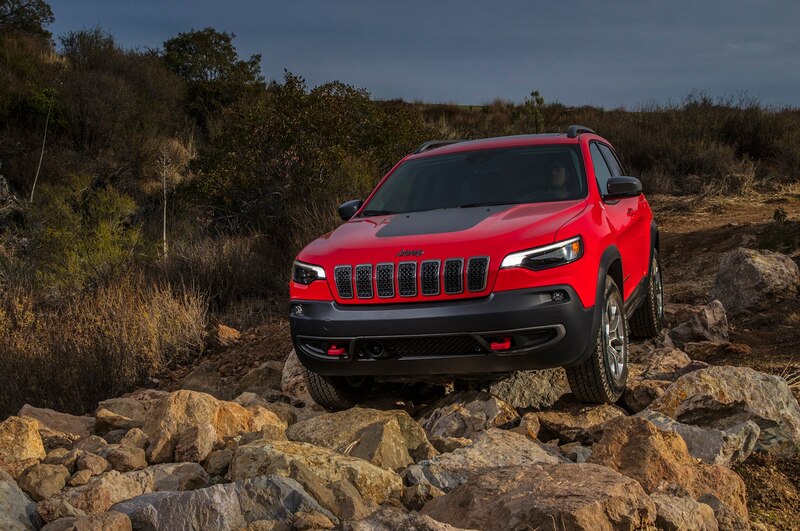 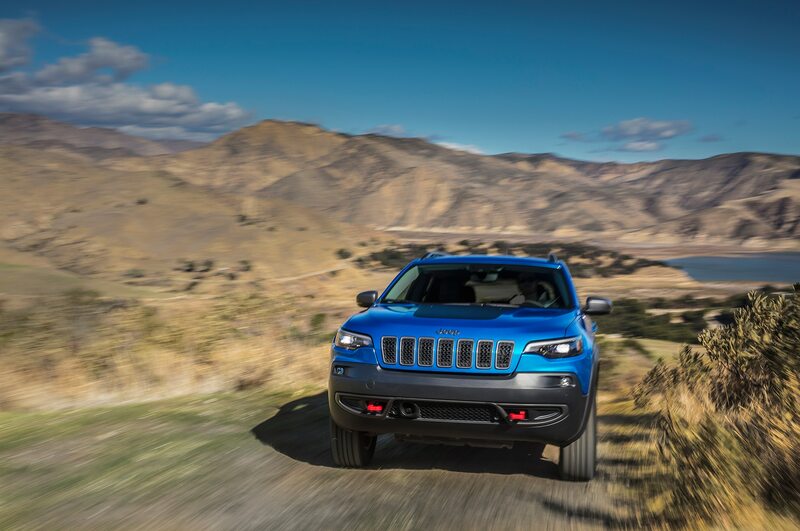 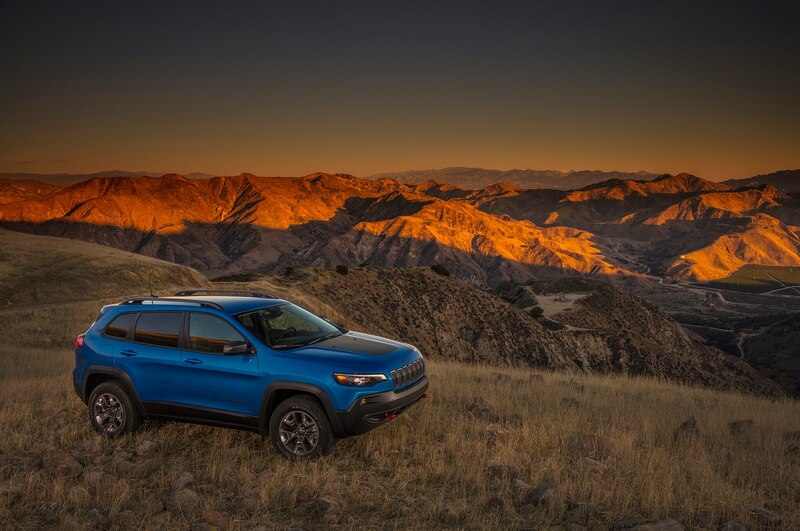 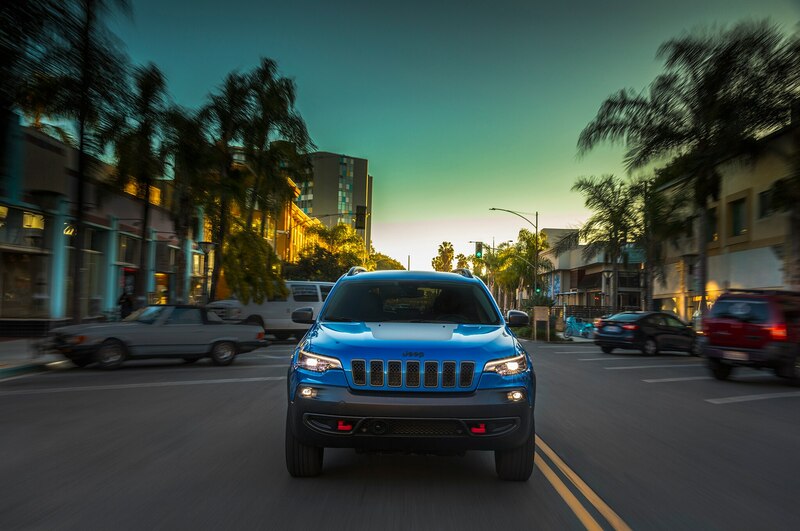 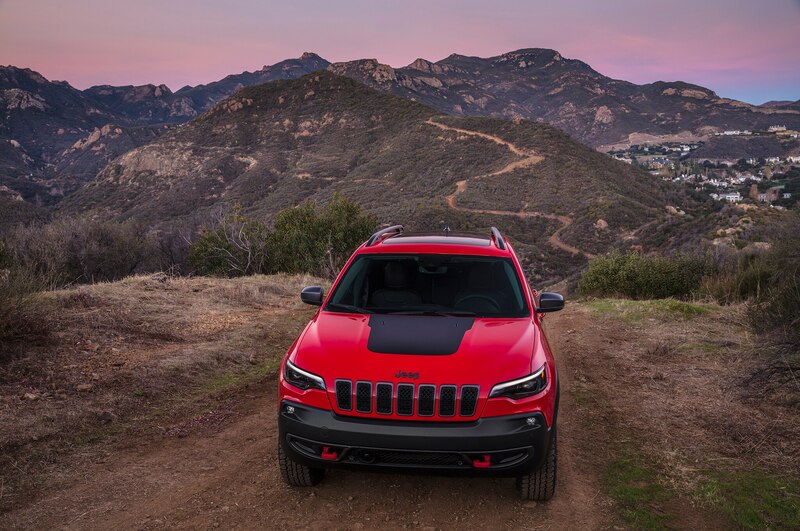 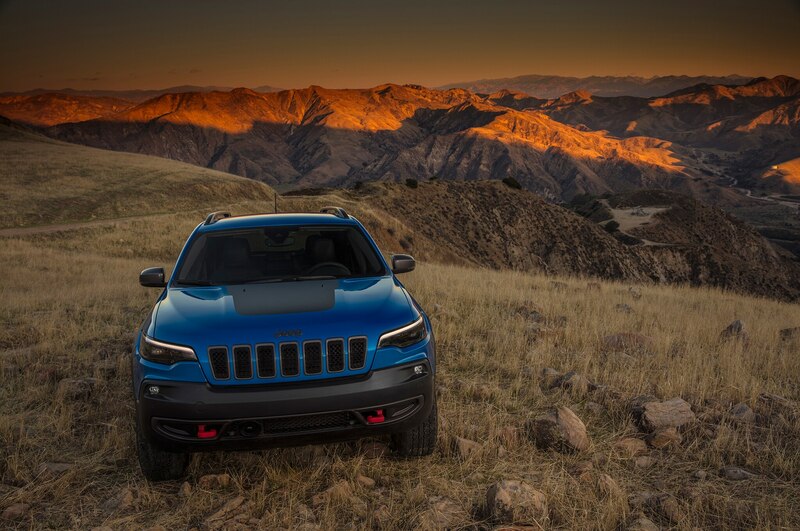 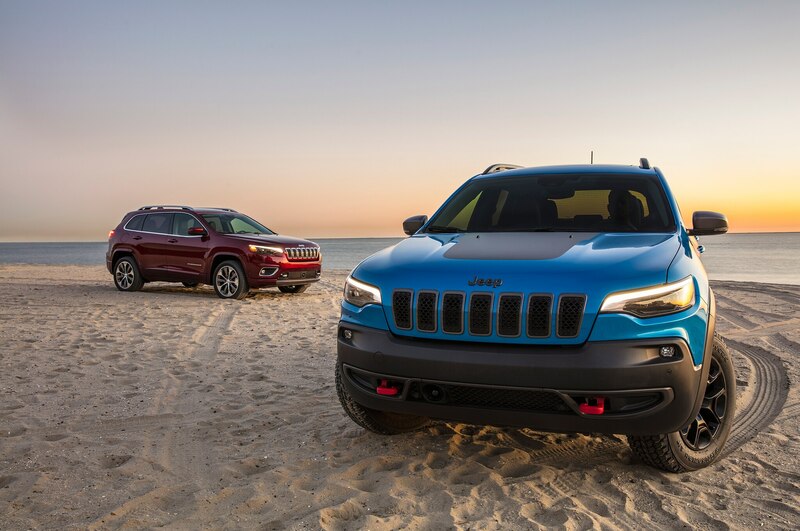 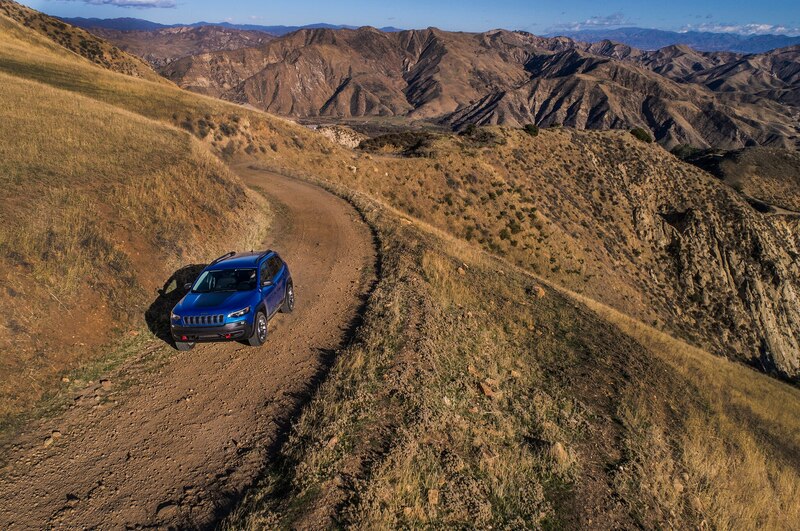 This Cherokee will take you anywhere—and the competition can’t say that. 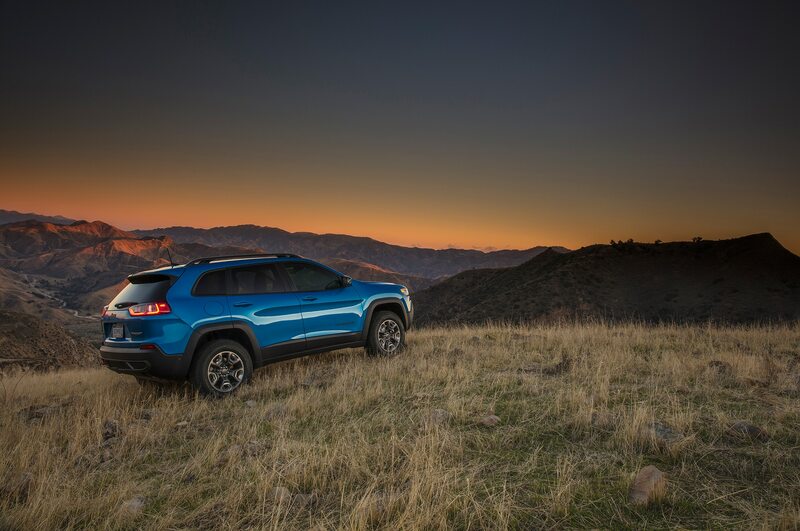 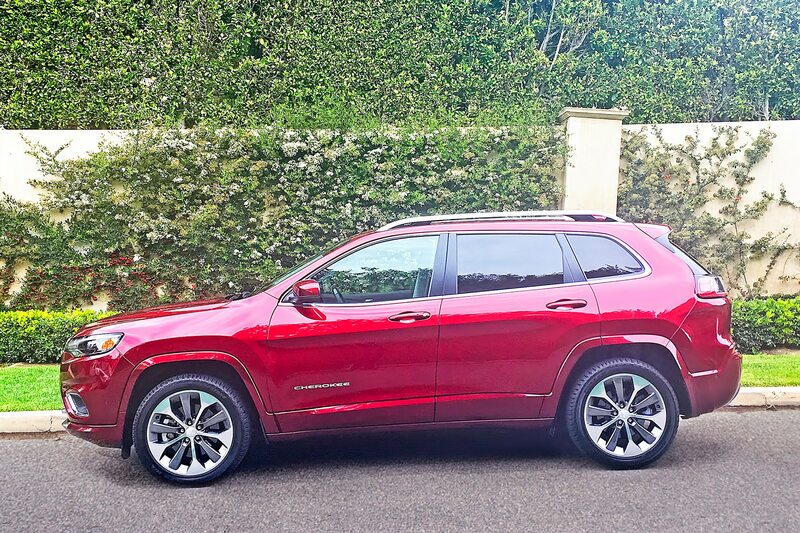 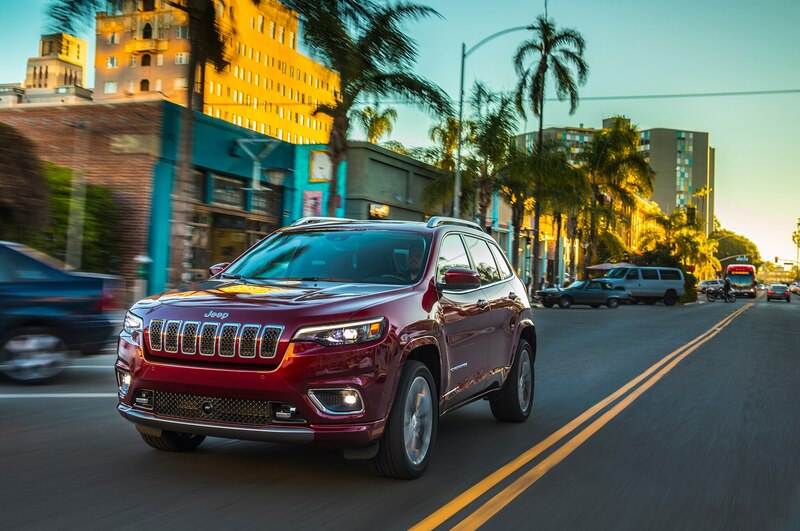 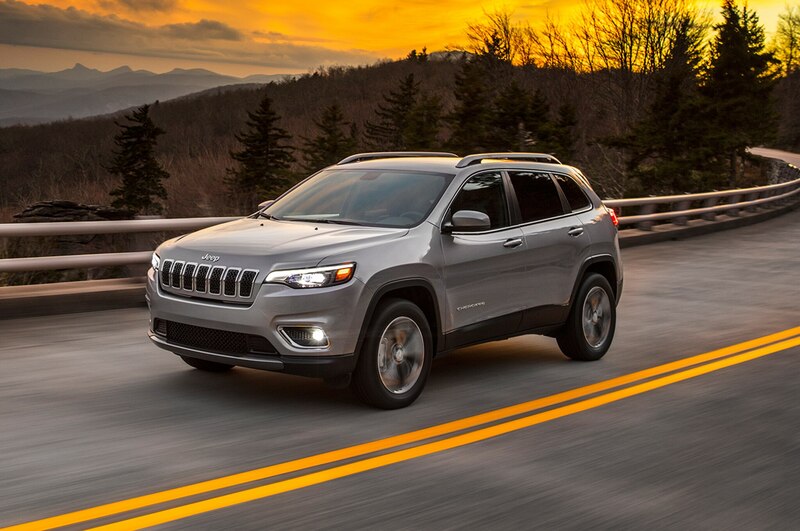 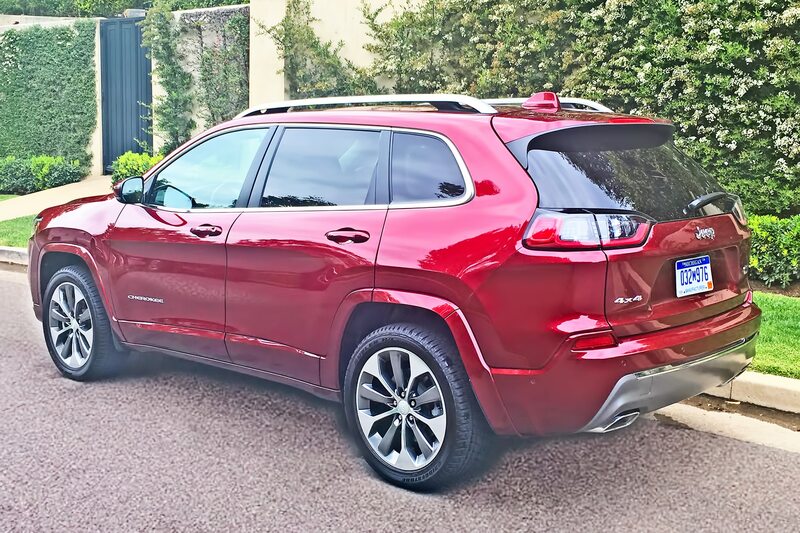 What struck me most over my week behind the wheel was what a sweet and refined experience the new Cherokee delivers. 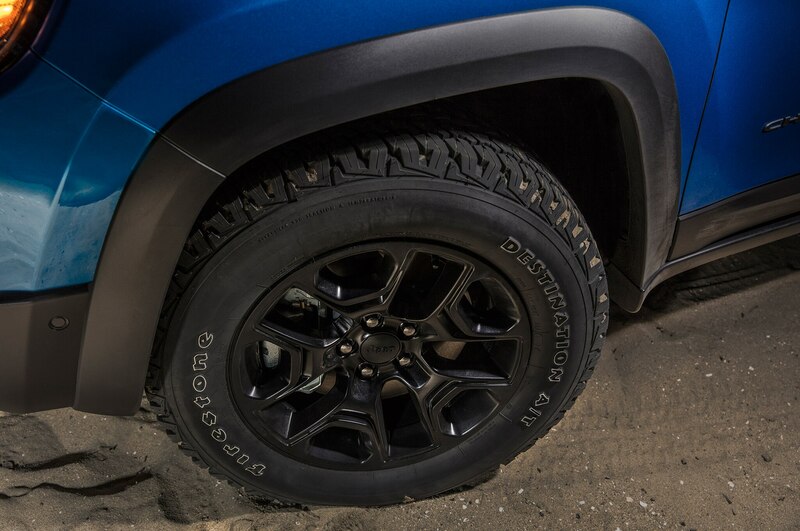 In day-to-day errands, it doesn’t feel truck-ish—yet it’s fully capable of acting like one when the need arises. 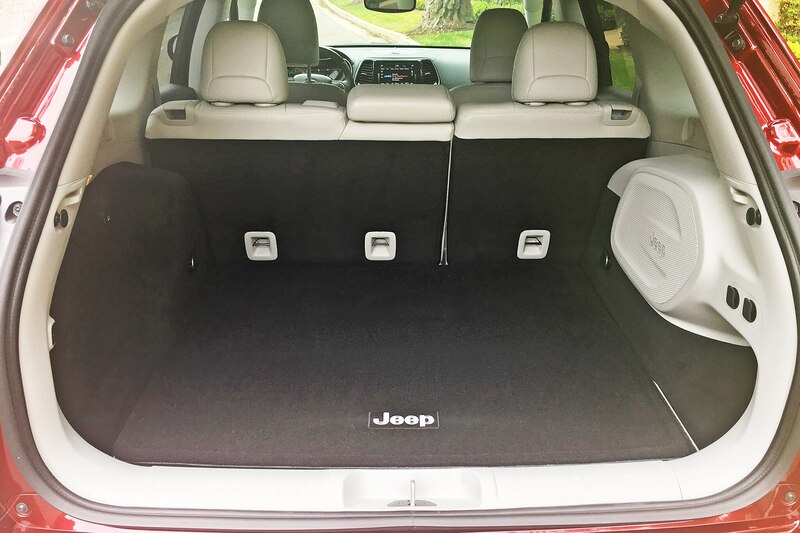 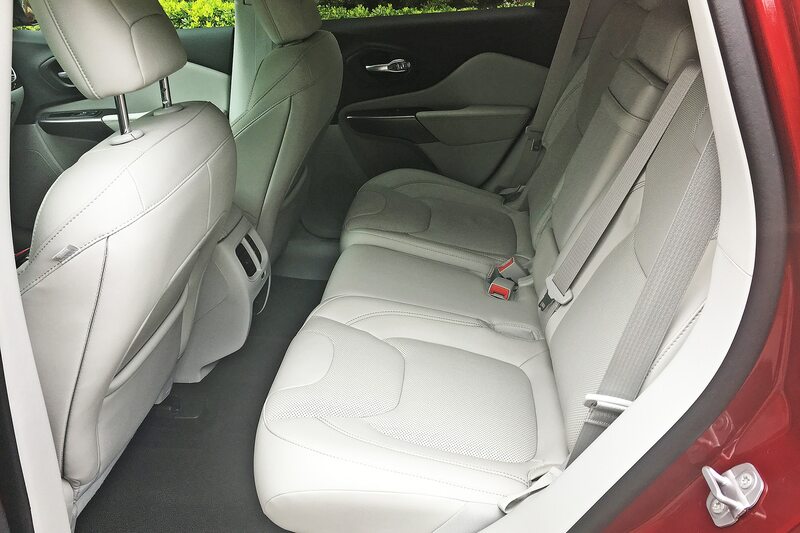 Several of my passengers said things like “This is only $40K?” and “Wow, I’d like to have one of these.” This is a friendly, luxurious, technology-packed SUV with room for your stuff and capabilities the rivals simply can’t match. 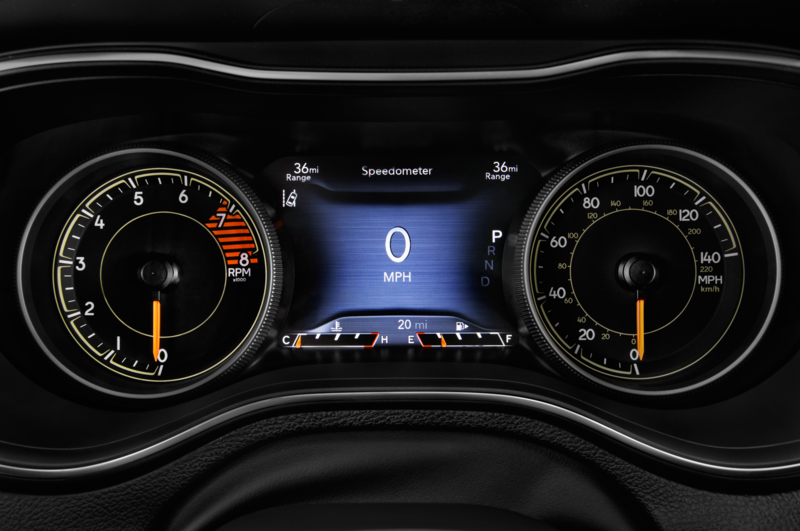 As it’s done with its new-for-2018 Wrangler, Jeep has scored another hit.